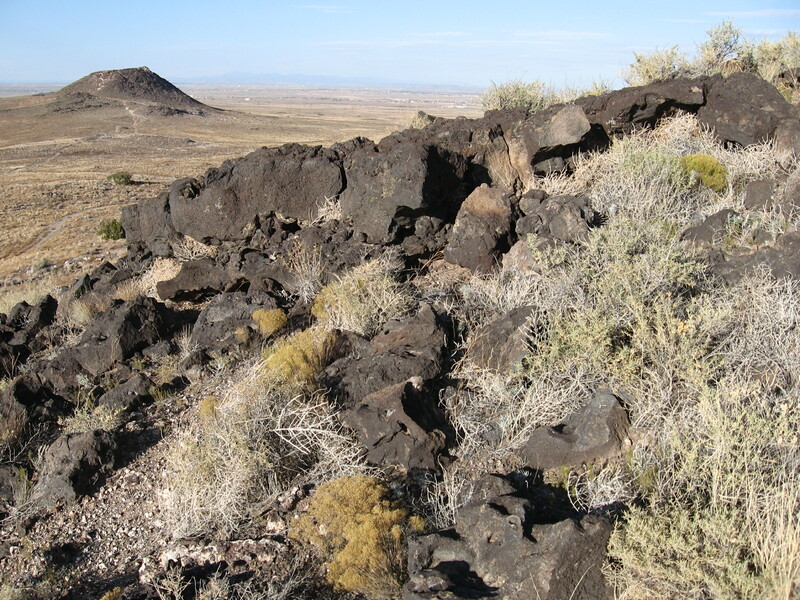 This afternoon we drove to Albuquerque’s west side and walked along the basalt escarpment and through Volcano Park in Petroglyph National Monument. 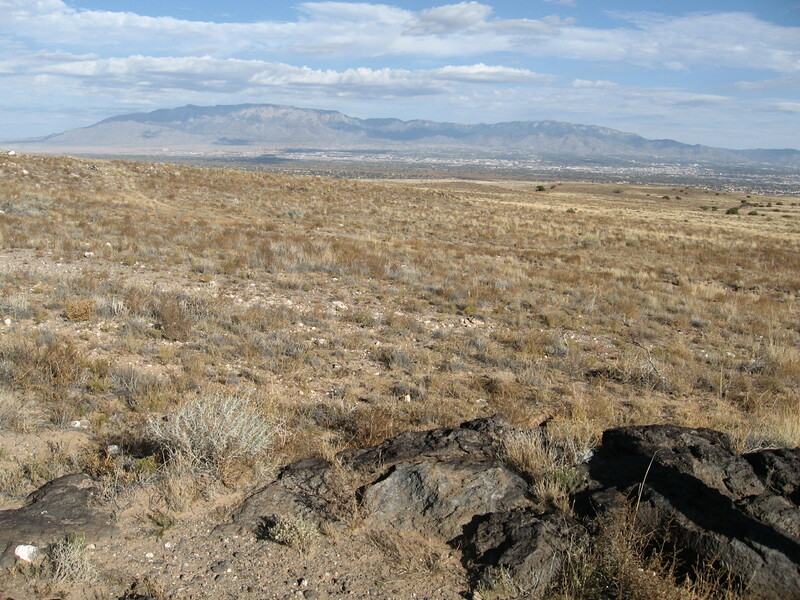 The Monument and West Mesa Open Space place limits on development not too far up from the river. 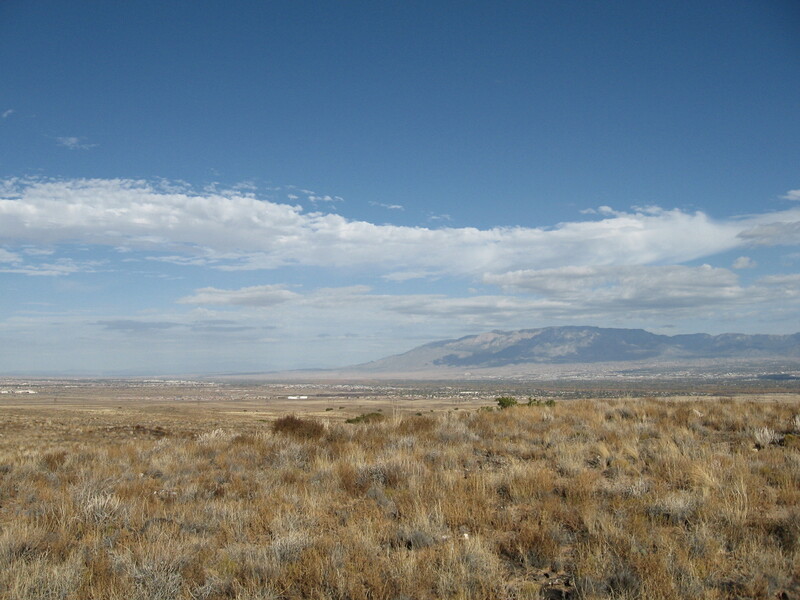 Out here on the high West Mesa in the wide open desert, the space and stark contrast to the forested mountains high above Albuquerque and lush riparian ecosystem within it are startling. The earth opens to sky. 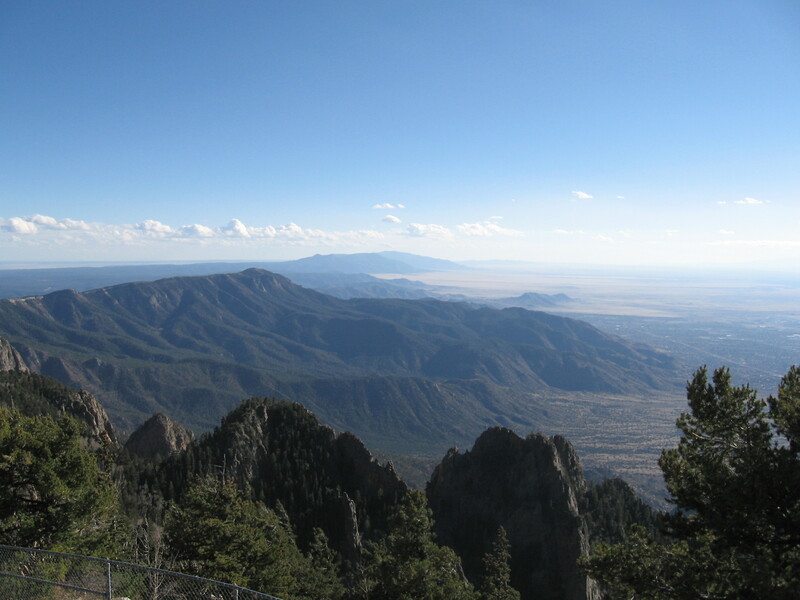 Taos, New Mexico’s plateau lends a sense of enormous space, but here in Albuquerque the views are outstanding as well and surprisingly expansive. There is nothing diminishing about this fine country. It is an interesting endeavor to think of a comparable city life that fits into this landscape without constraining it. 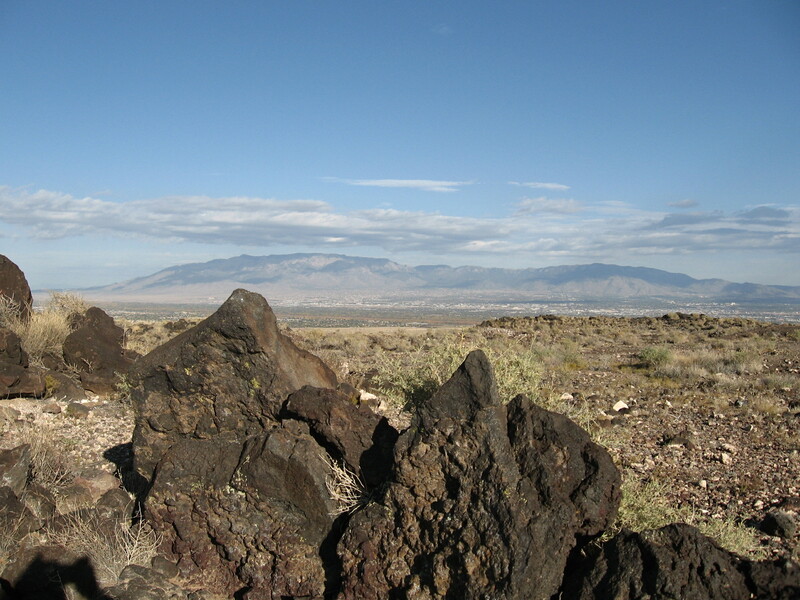 Desert Views. Nothing escapes from the sun out here. When you get out of the city here you really get out. 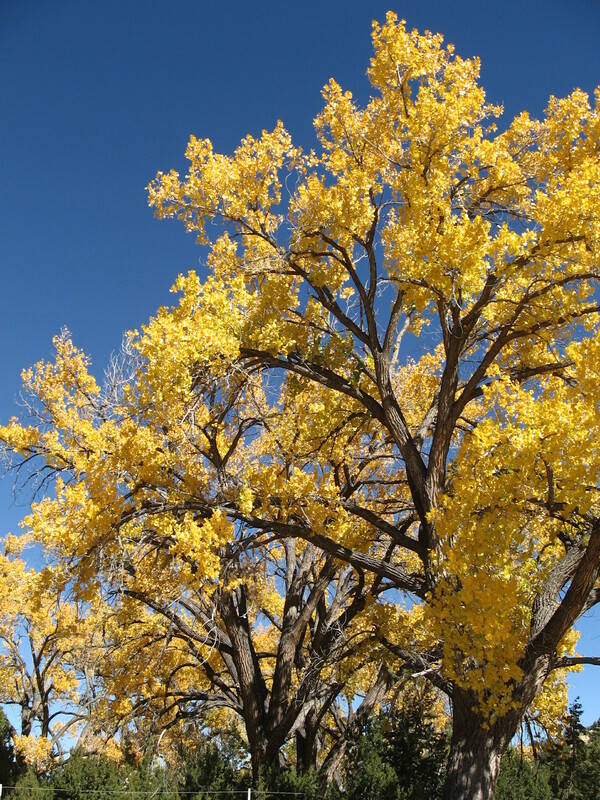 This is an important element in the flavor of Albuquerque. 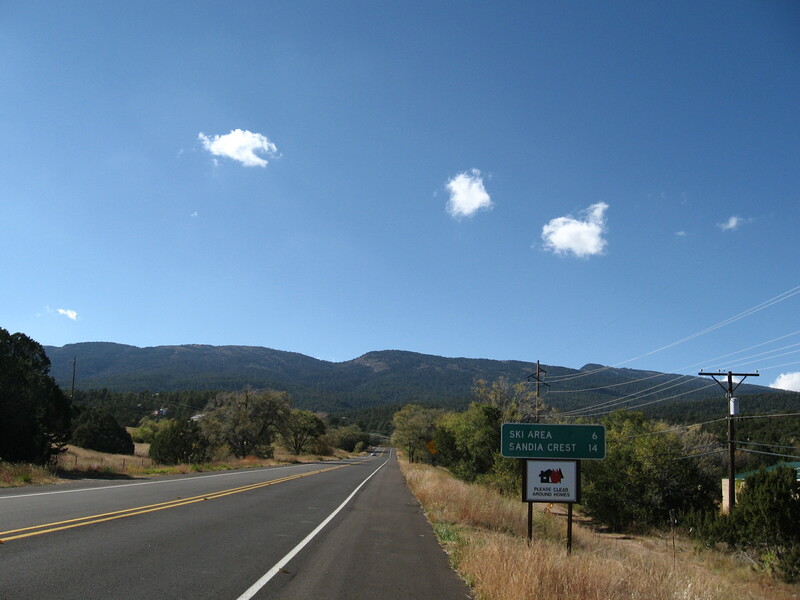 We took interstate 40 across town and exited on Atrisco Vista Boulevard to reach Volcano Park. 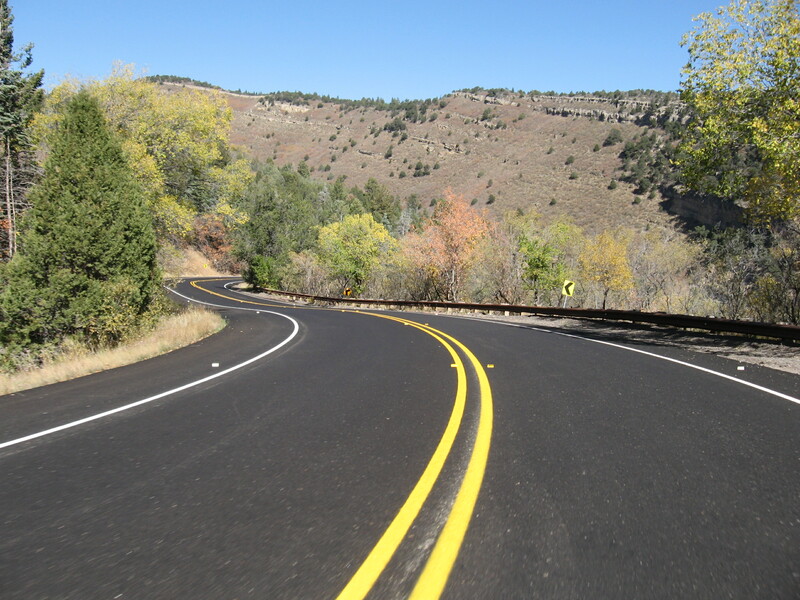 They have repaved Atrisco Vista Boulevard and included sweet bike lanes. 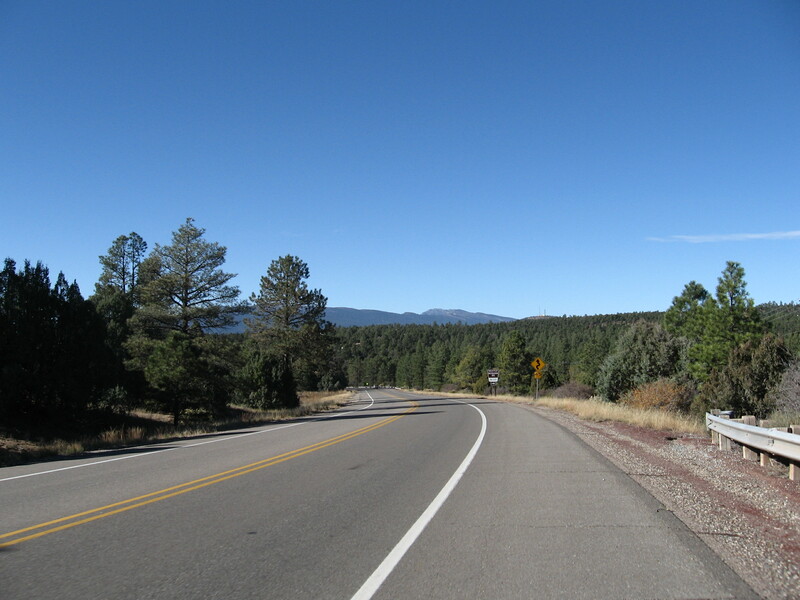 It would be a great place to come train on a time trial bike. 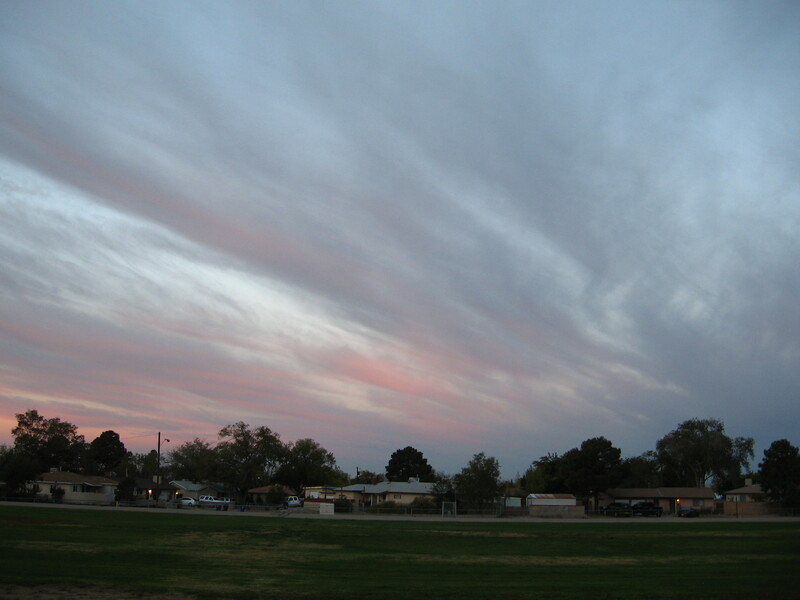 Maybe ride out here on Central Ave. or Rio Bravo Blvd. 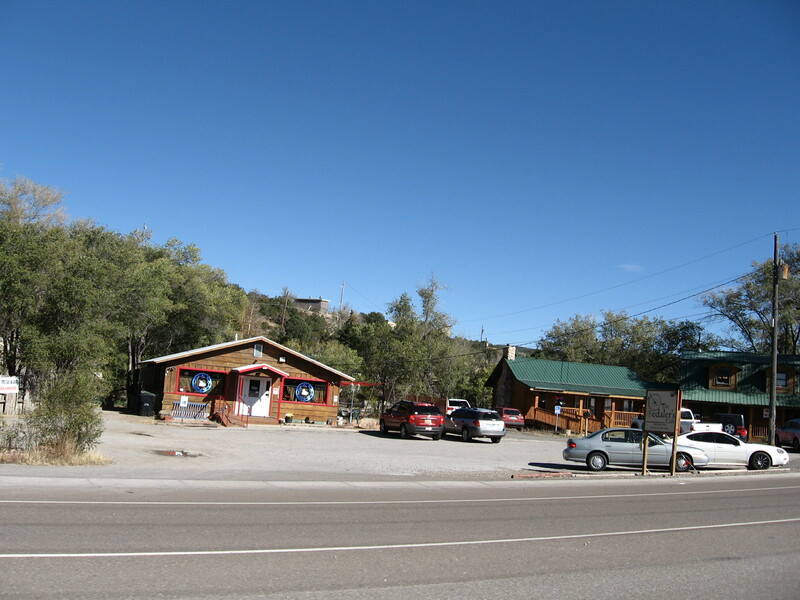 Everything at Petroglyph closes at 5pm, so we had to hurry back to our car. The National Park ranger was there locking the bathrooms and waiting for us to go. 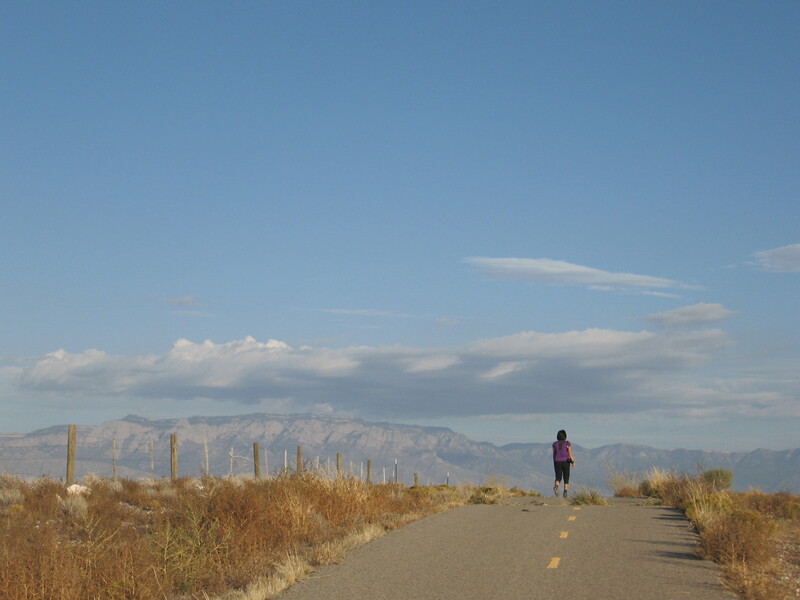 We went a little further down the road to the paved Paseo de la Mesa Trail, which is City Open Space. 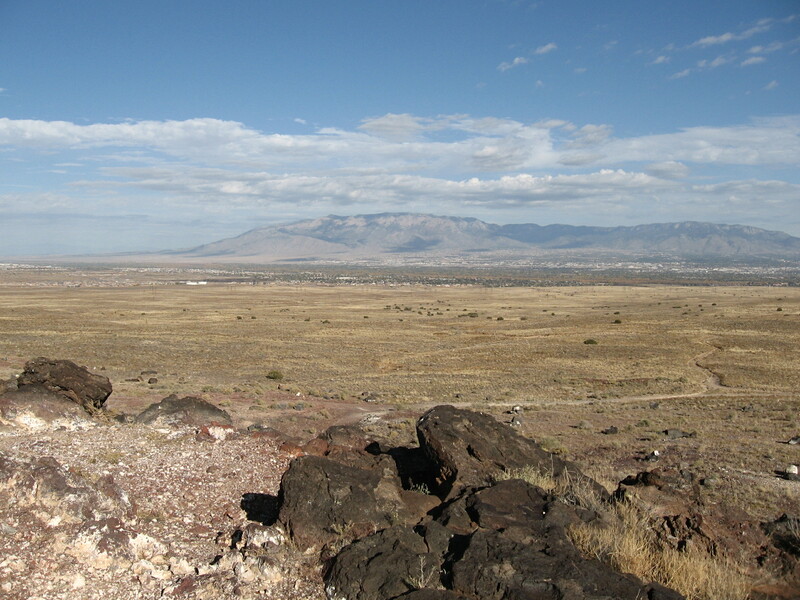 This would be a good place to observe a moon or sunrise, the stars, or the balloon fiesta. 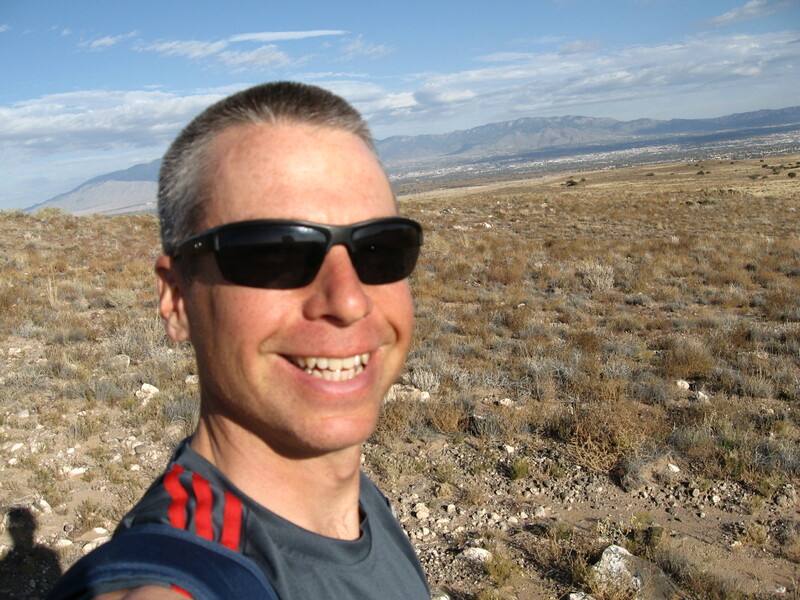 This entry was posted in Uncategorized on October 31, 2014 by bikeyogiblog. 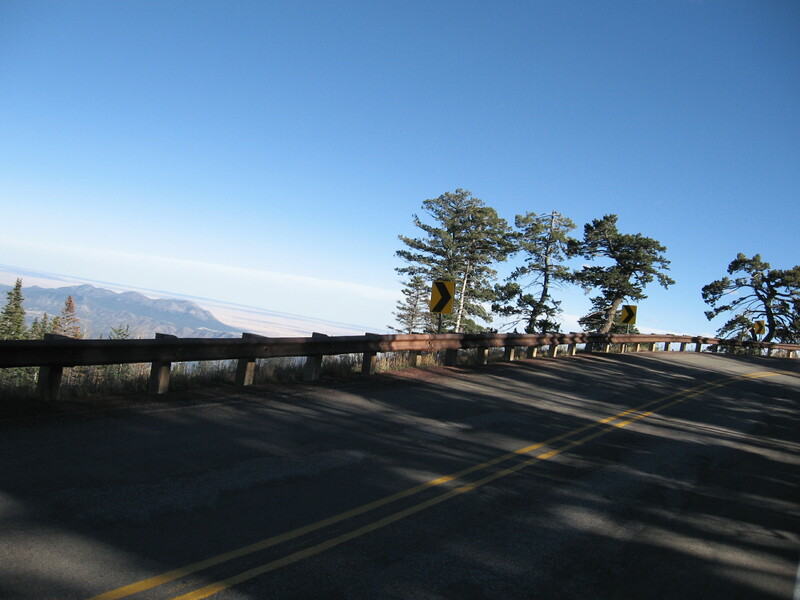 Do every ride with the NM Touring Society and you’ll have bicycling chops like Michael Hedges has guitar playing chops on Aerial Boundaries . 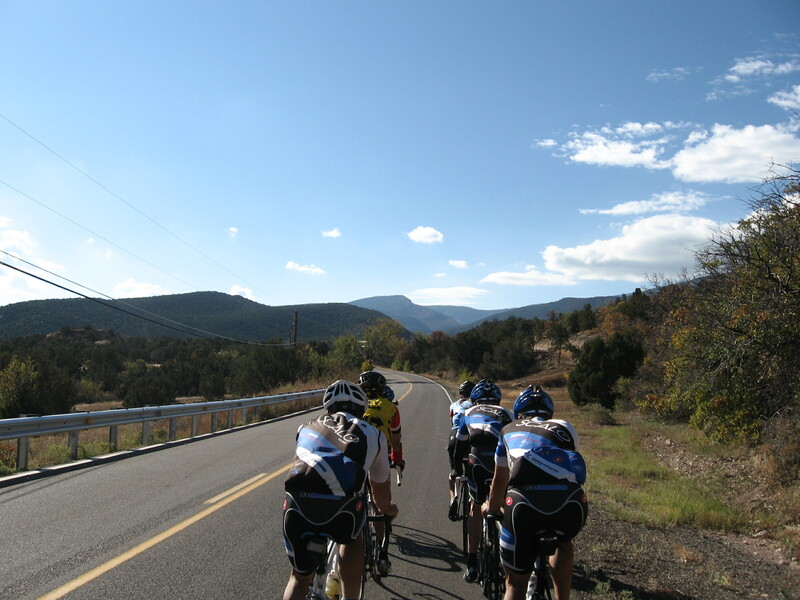 The New Mexico Touring Society is my all time favorite cycling club. I’ve been pouring over their “rides” page for years. 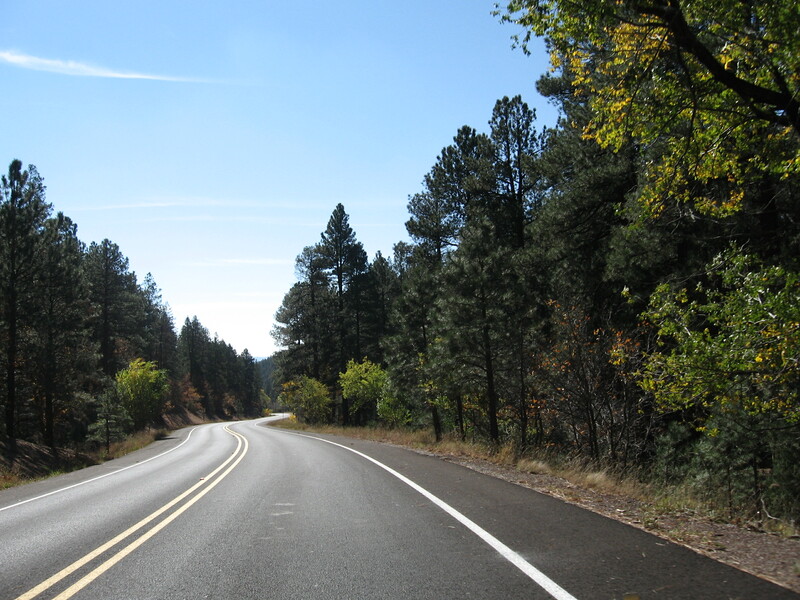 They have over one hundred routes and are fast updating it. “No one can complain of lack of routes”. 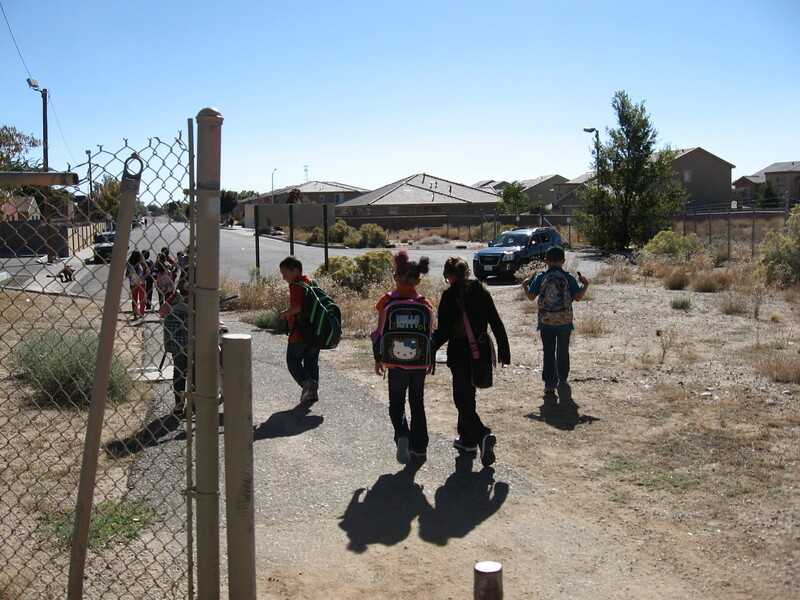 Teachers need students, companies need customers, bicyclists need routes. Places to ride! The Freewheel, the NMTS monthly publication, is like the touring bicyclist’s localized New York Times. This club does amazing things! For one, they put on rides everyday. 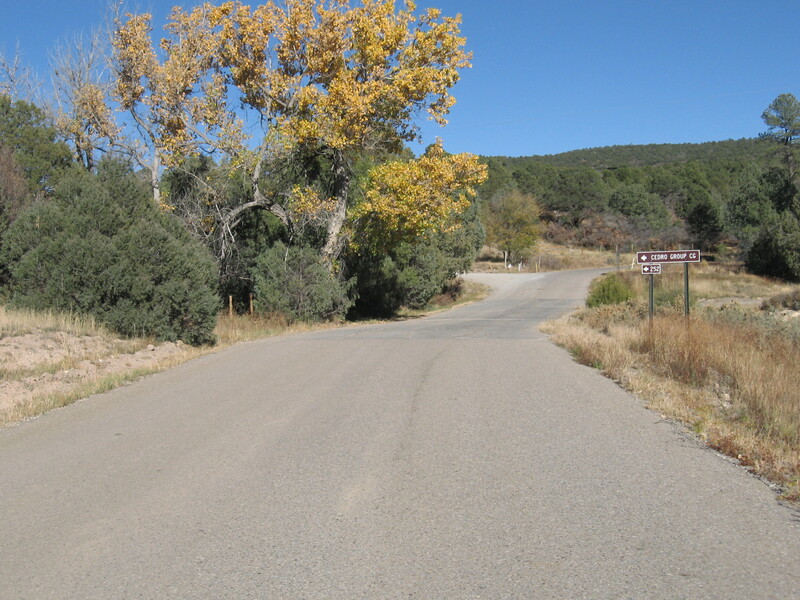 They go to cool places like Tent Rocks, and have different strokes for different folks including this “get fitter faster” route through the fabulous foothills on Thursdays. 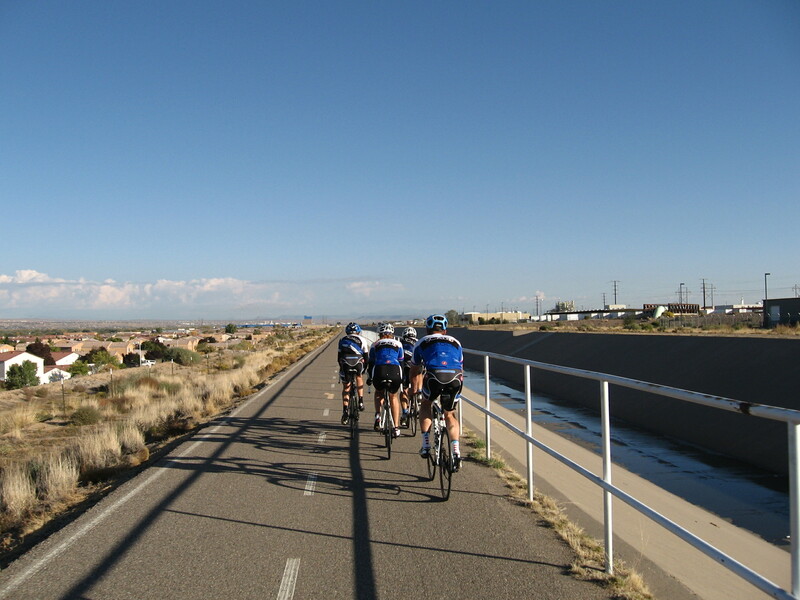 If you don’t want fitness being the main focus of your riding, they host three other rides every Thursday as well, some of which have the Flying Star eatery on the route itinerary, made famous for desserts. 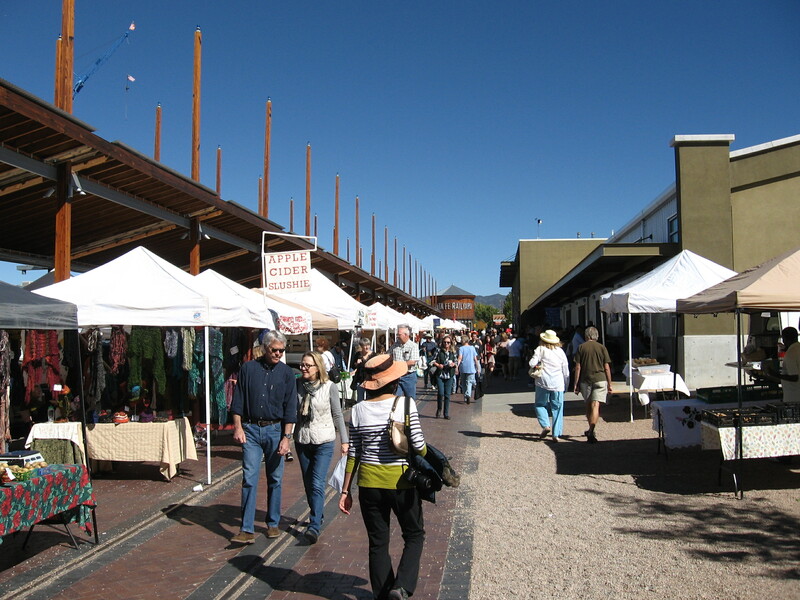 Mostly they are just finding great pleasure in New Mexico’s wonderful network of roads and scenic attractions and exploring the intriguing New Mexican character wedded in the coming together of land and people through a long flowing history. 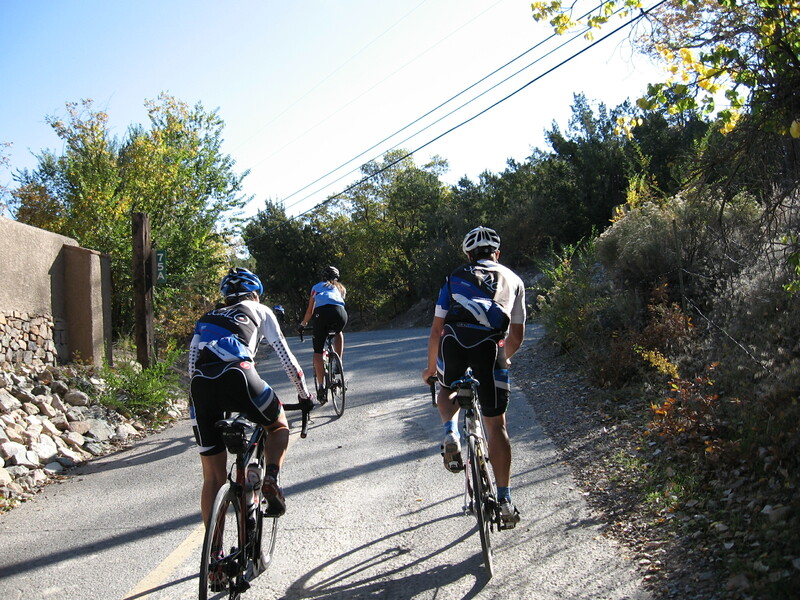 In NMTS I see very careful and generous hearted practitioners engaged in the art and science of bicycling. 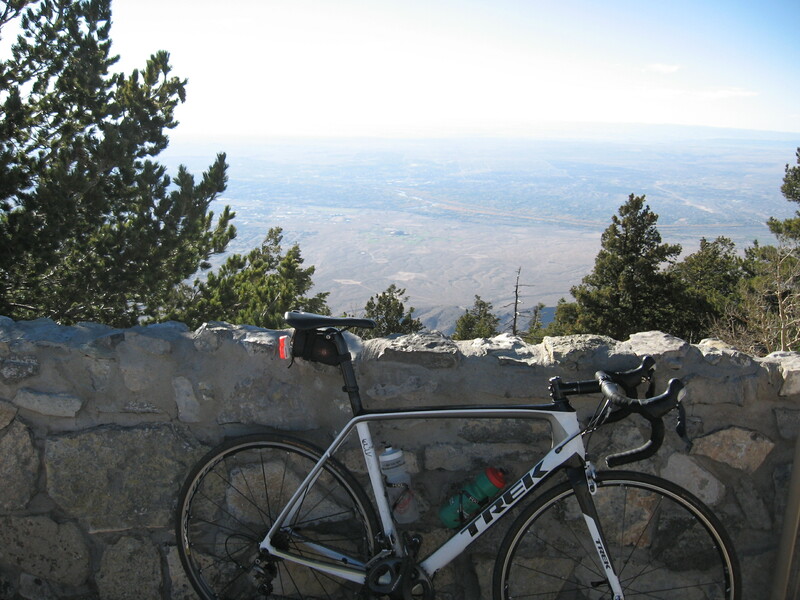 This entry was posted in bike culture, Bike Org of the Month on October 30, 2014 by bikeyogiblog. 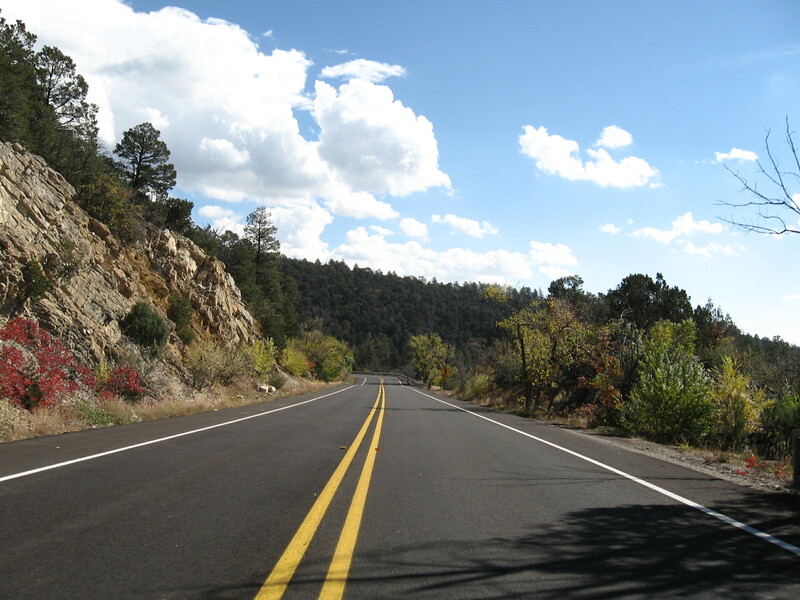 This song reminds me of the ride to a little neighborhood called Tranquillo Pine south of Tijeras, New Mexico. Here’s a map with some options. 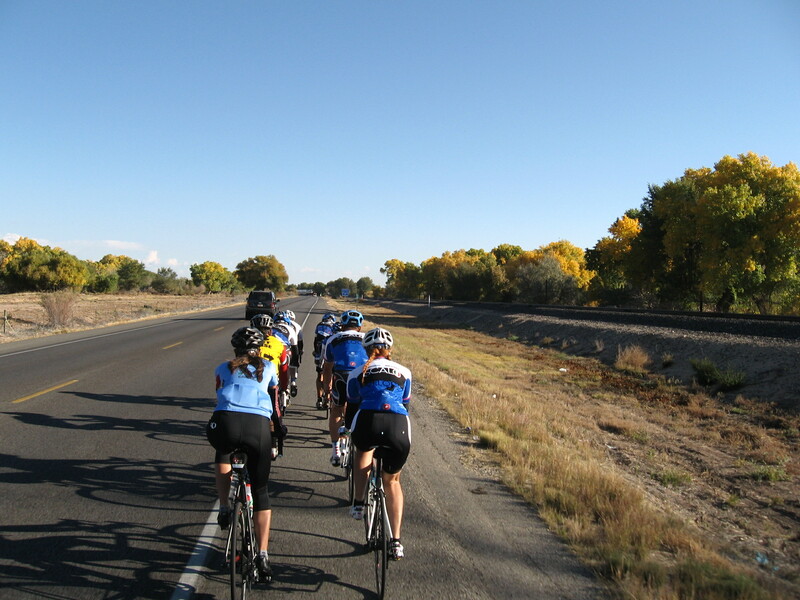 There are so many roads to explore best to get an exquisite muffin and coffee at the Pedaler’s Cafe, regroup, ride more! 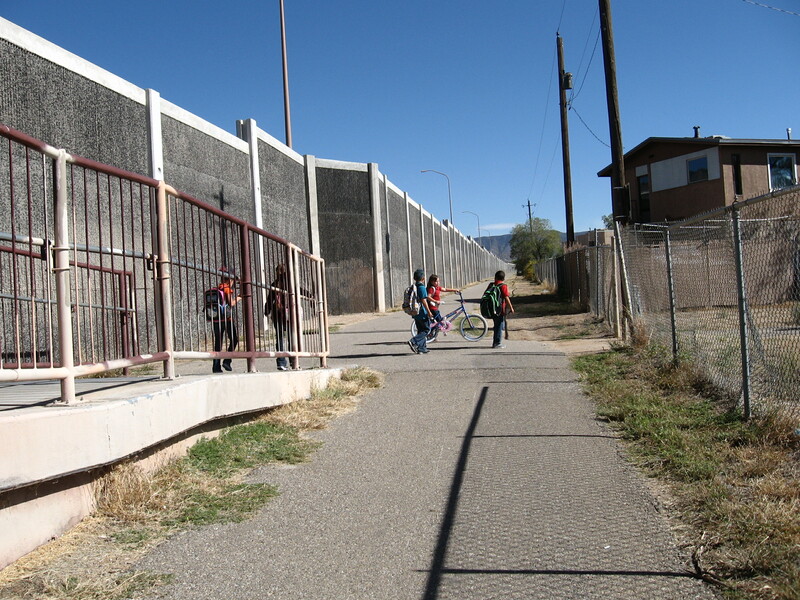 I ran into a bunch of kids using the bike and pedestrian bridge at Tomasita Street over I-40. Fun to see the next generation building the leg power. I remember my bmx days. Funny how we grow into those backpacks. 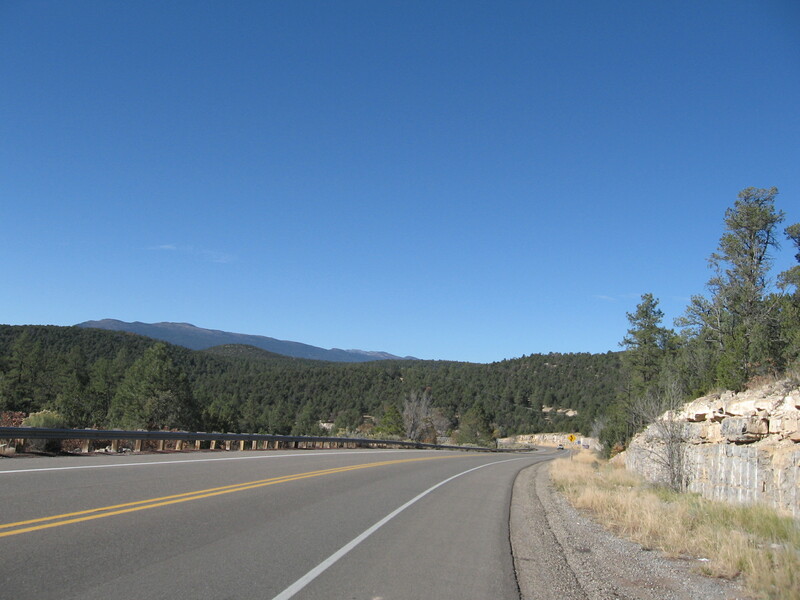 I-40 is just over the wall to the left. The kids have just crossed over it. 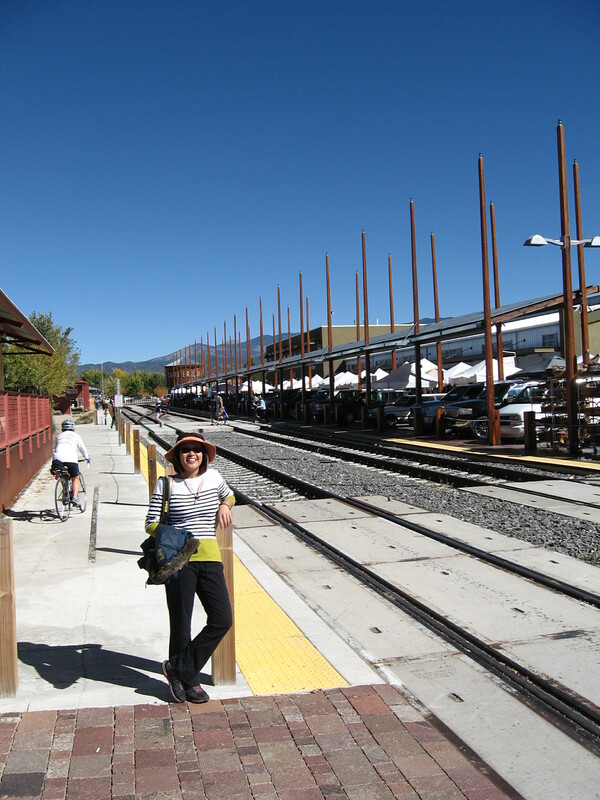 The multi use path has access to adjacent neighborhoods and is very useful for many purposes. Kids rock. 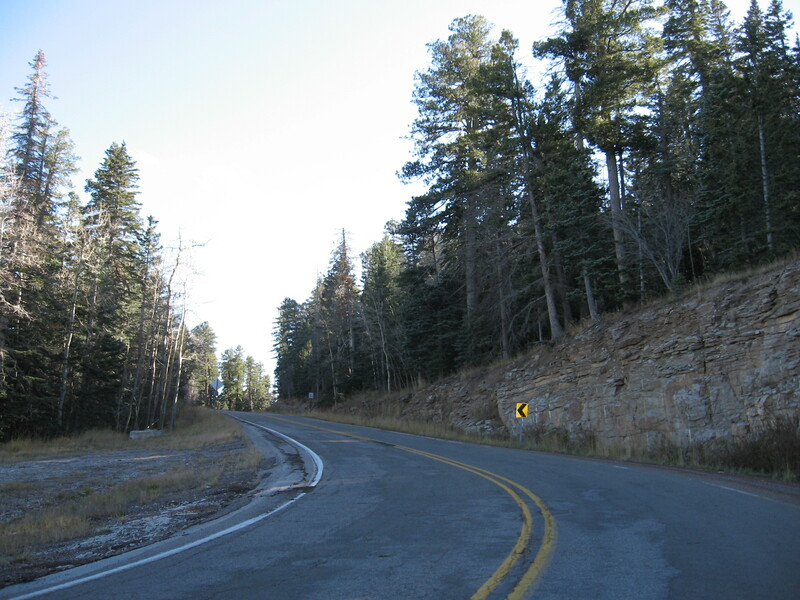 Right in Tijeras takes you down South 14, otherwise known as Highway 337. 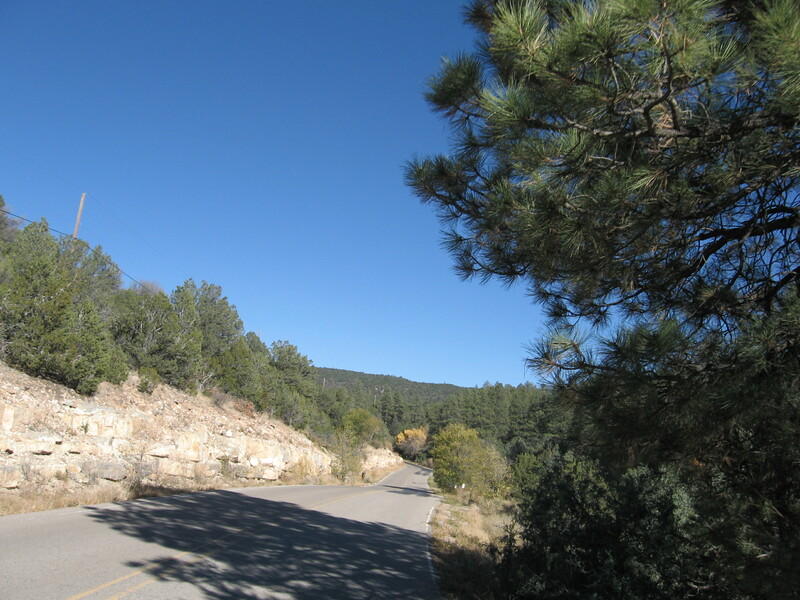 It climbs from Tijeras at 6,300′ to about 7,500′ in Tranquillo Pine, winding through a canyon along the way. Nothing very steep. 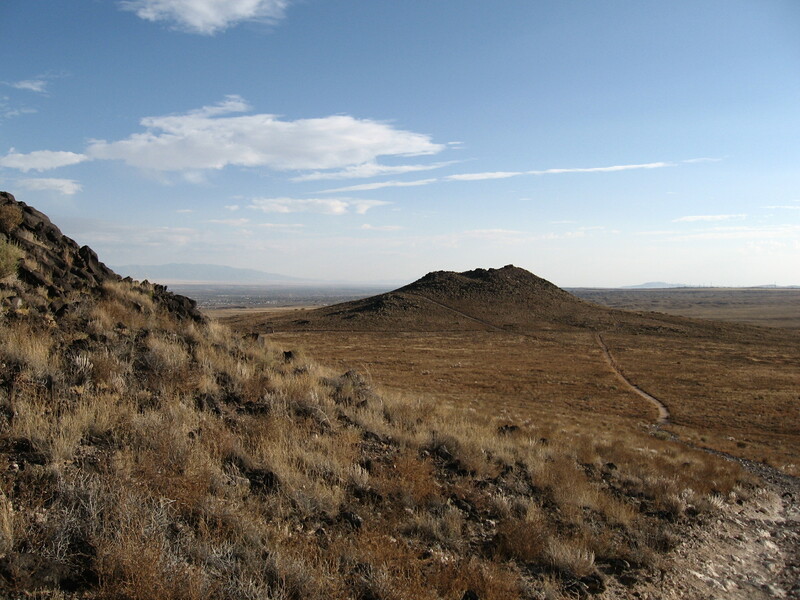 There are many places for mountain biking along this route. 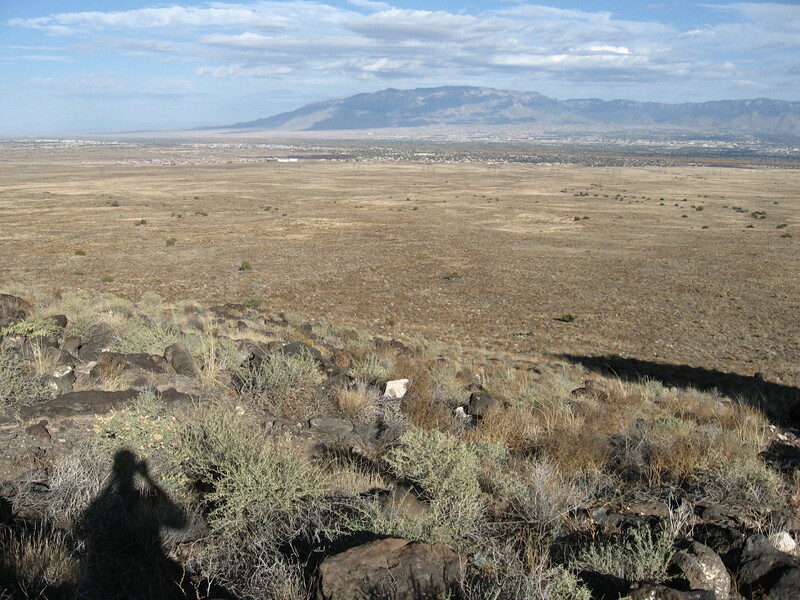 I’m looking for a nice trail over from Albuquerque, but it seems most people drive. 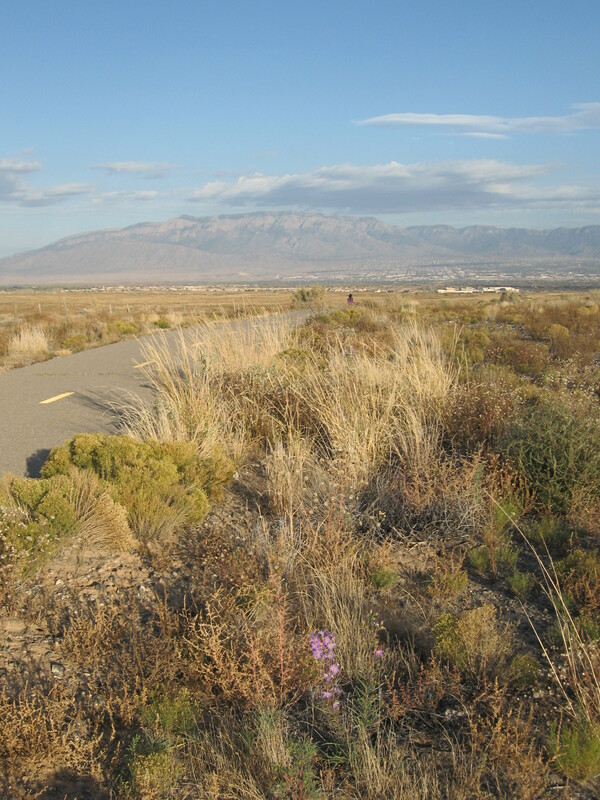 Kirtland Air Force Base has withdrawn most of the land on the west side of the Manzanos from public use. 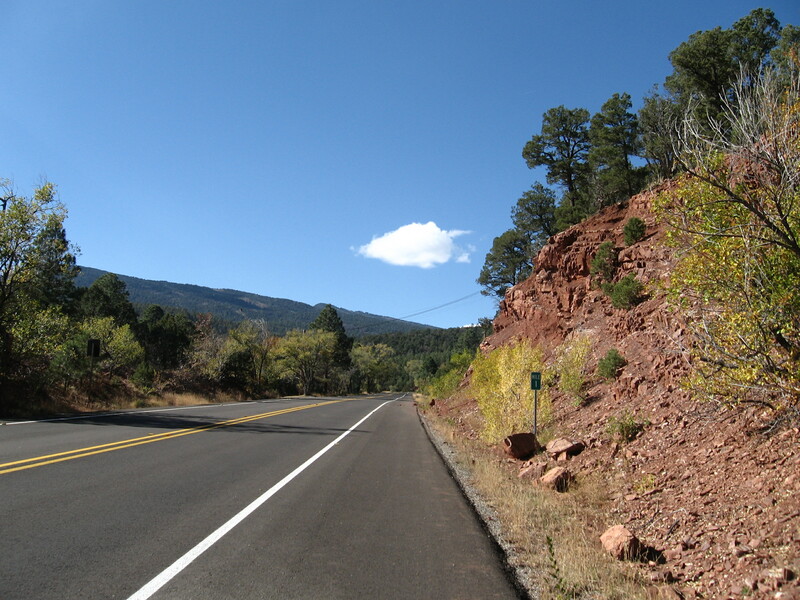 If you’re riding in this area stop by the Pedaler’s Café just south of Tijeras. Yes, those are coffee cups inside bicycle cranks on the front windows. They have more bike paraphernalia all over the tables in there, magazines, bikes for sale, etc. You’ll get a buzz just by walking into the place. If you’re biking your metabolism needs a hit of sweet cake. Yes. 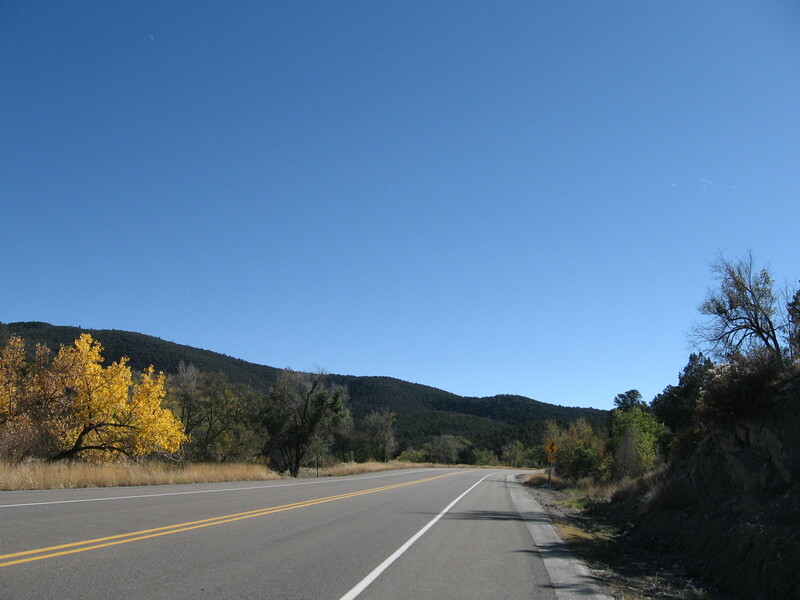 It takes a few pedal strokes to get out of Tijeras, New Mexico although it is so small you don’t feel any need to get out. 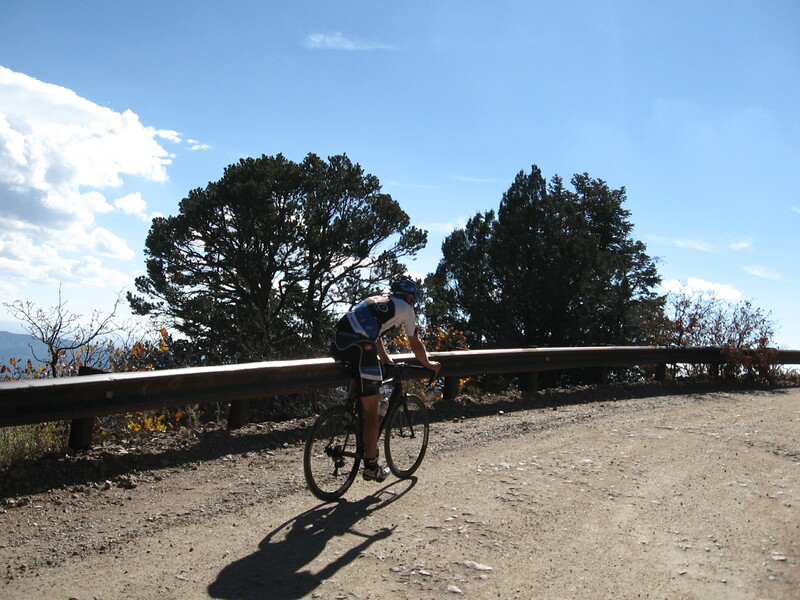 The descent is engaging, you pedal, fly, corner, pedal, fly. Playing with gravity. 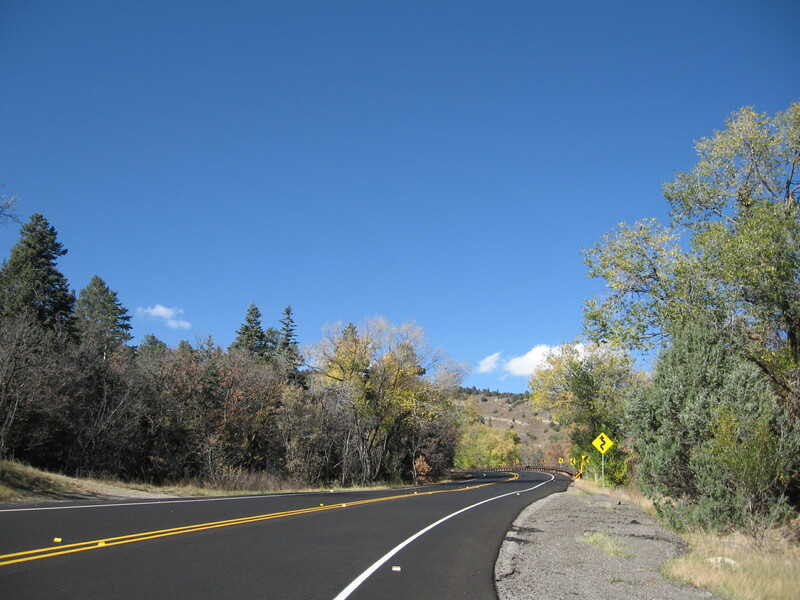 Although you can’t tell from my pictures South 14 is a medium traffic road because it carries all the commuters who live in the eastern Manzano communities. 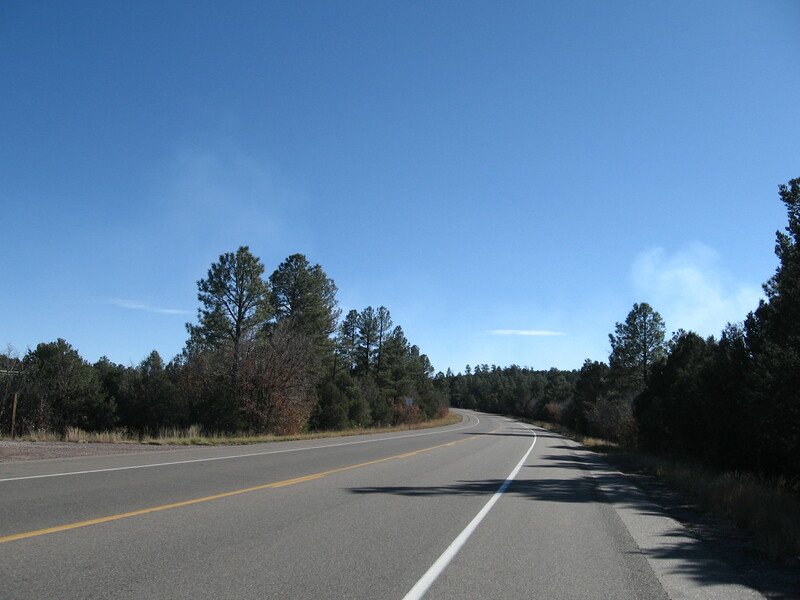 I wanted to search out a quieter road since I didn’t get to do the Oak Flat-Anaya loop because of smoke. 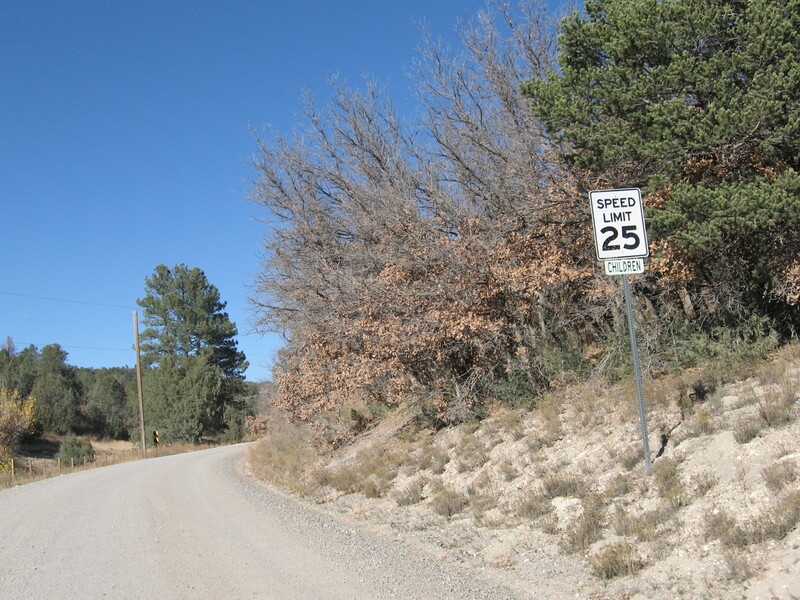 So I turned right on Juan Tomas Road. I can’t say enough about what a joy it is to travel by bicycle to all these wonderful places. I know folks feel intimidated by the exposure to weather, or are not sure you can do this. Yes you can! 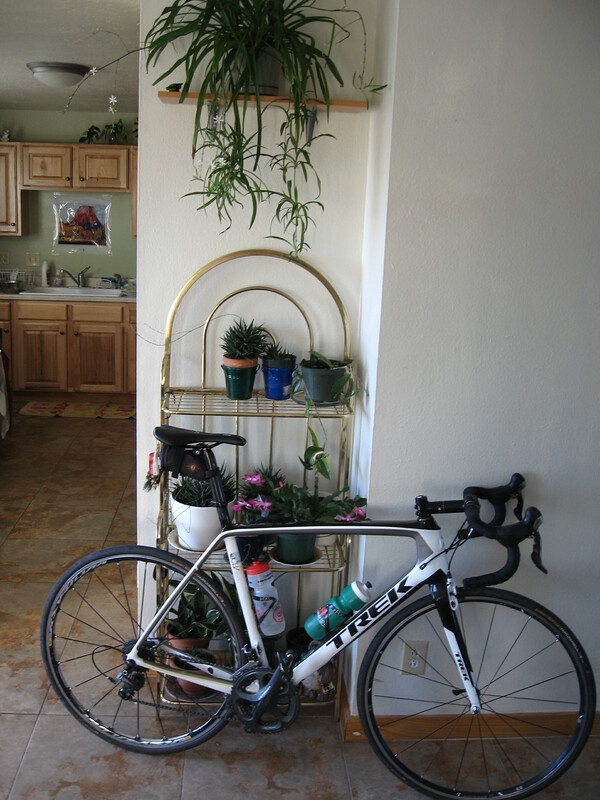 Check your preparations with cyclists friends and give it a whirl. 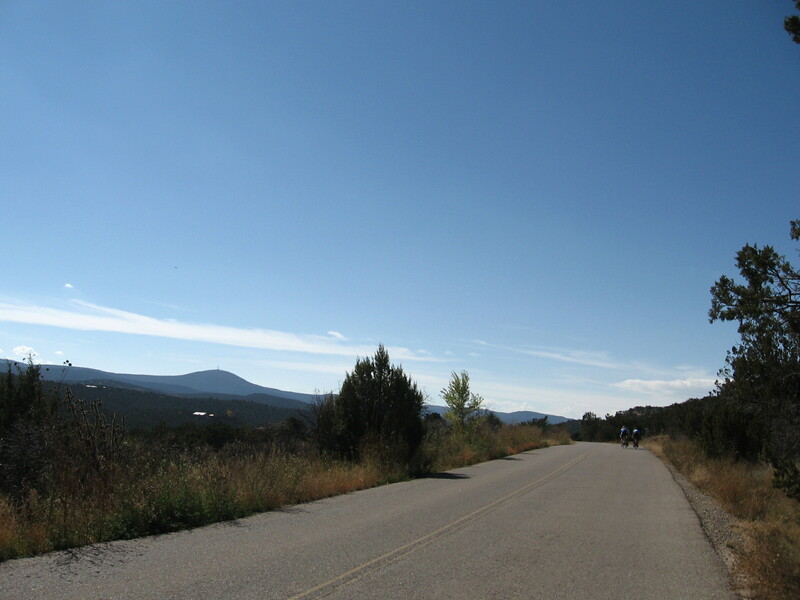 The rewards of exploring on a bicycle are immense and stay with you forever. Worth the small cost of pushing your legs over the pedals. Dinners taste better. Rest is more settled. And the fitness you gain. Wow! 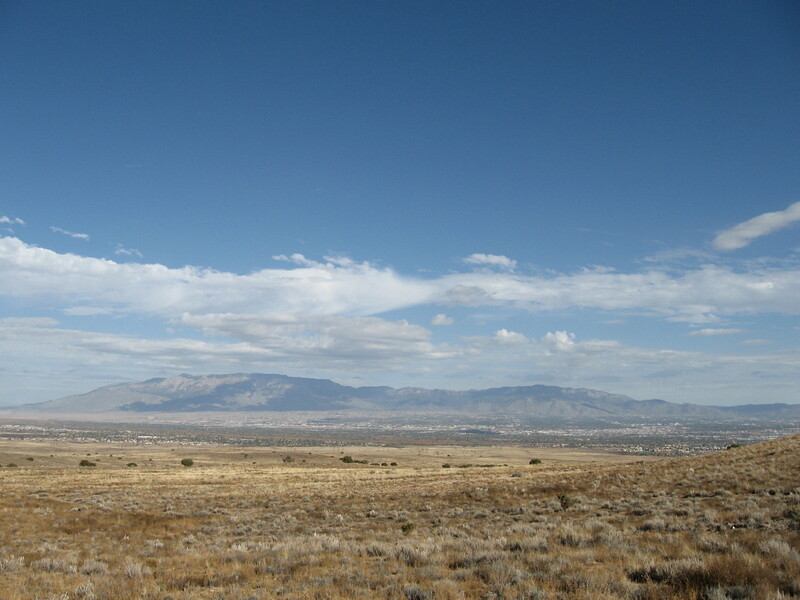 views I’ve never had before, here is Mosca Peak and Guadalupe Peak, Manzano range. 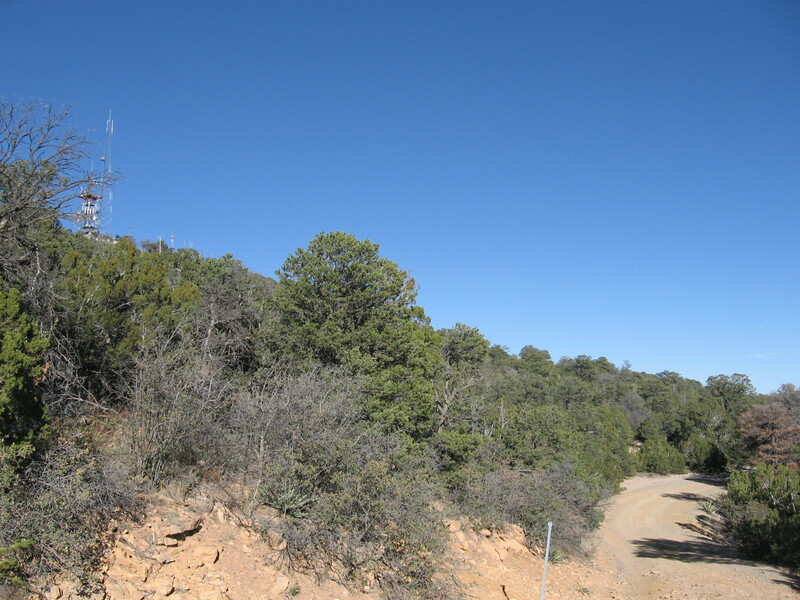 Cibola Forest is huge. 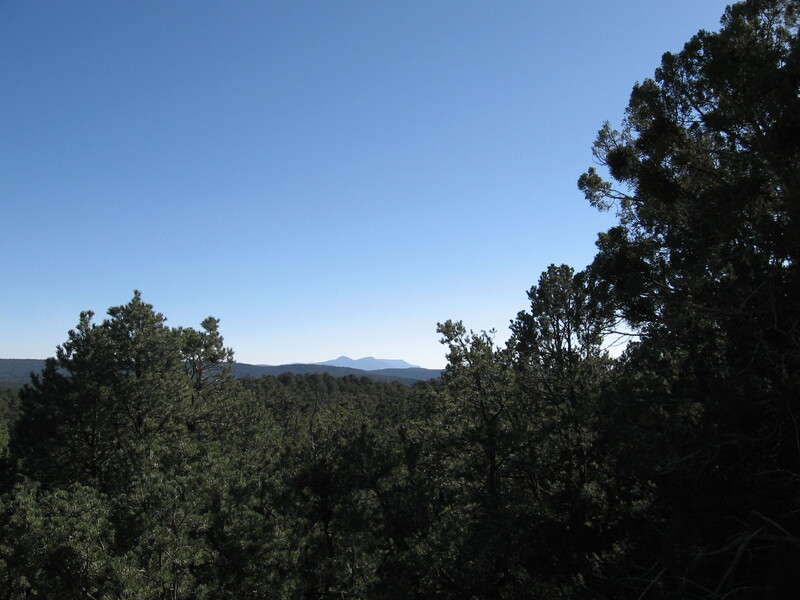 there’s Cedro Peak up and to the left. The road is gated so I could not go all the way up. 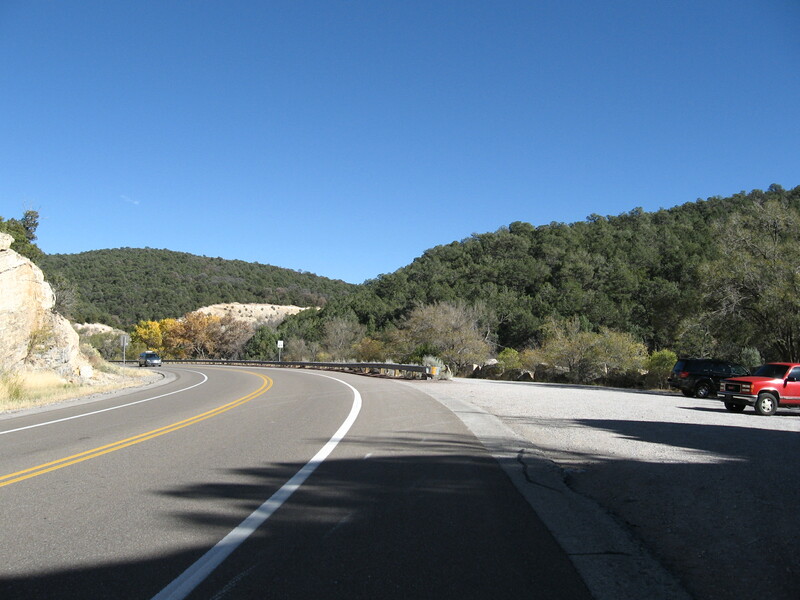 I use my red flashing rear light when riding between light and shadow in the canyons. Be safe. Have fun. Enjoy! 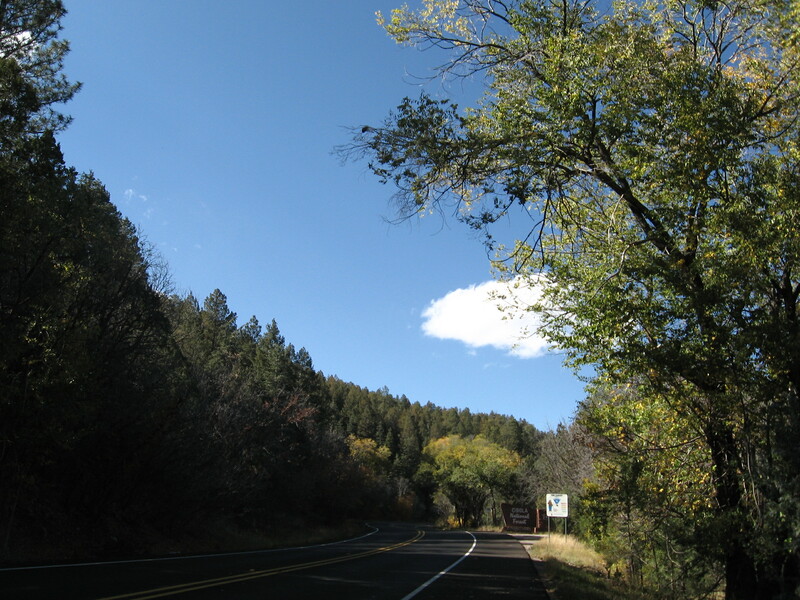 This entry was posted in biking New Mexico, exploring by bike on October 29, 2014 by bikeyogiblog. 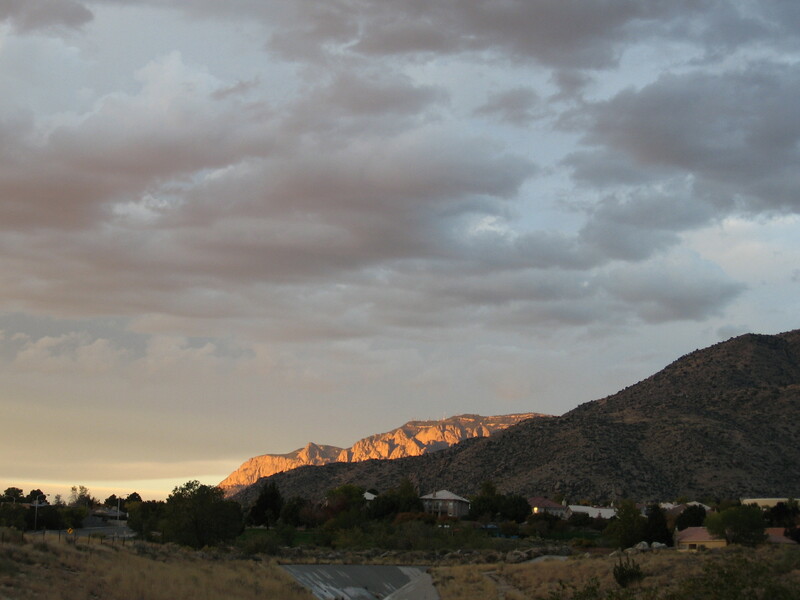 The Sandia Mountains rise abruptly on the eastern edge of town. When you look up at the them it is hard to imagine you can ride your bike up there on a paved road that goes all the way to the top. 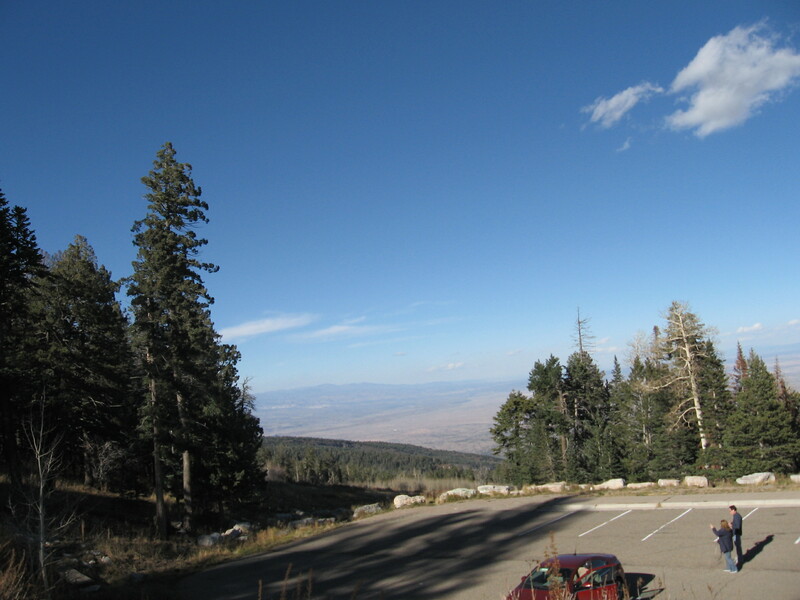 We live at about 5,300′ in Albuquerque and the Crest tops out at 10,600+ feet. That’s a mile of climbing! Here’s a map of the ride. Here’s a song to go with the pictures and narrative. 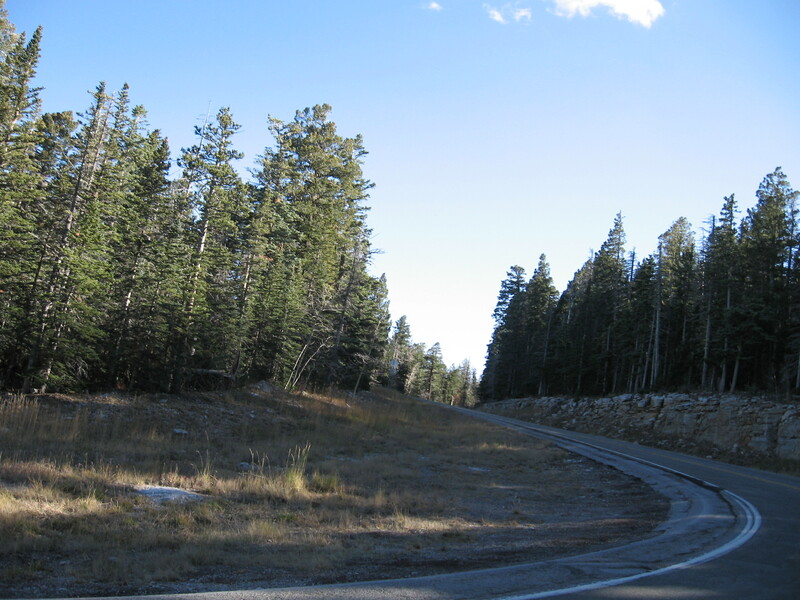 The elevation at the bottom of the Crest road is 6,900′. 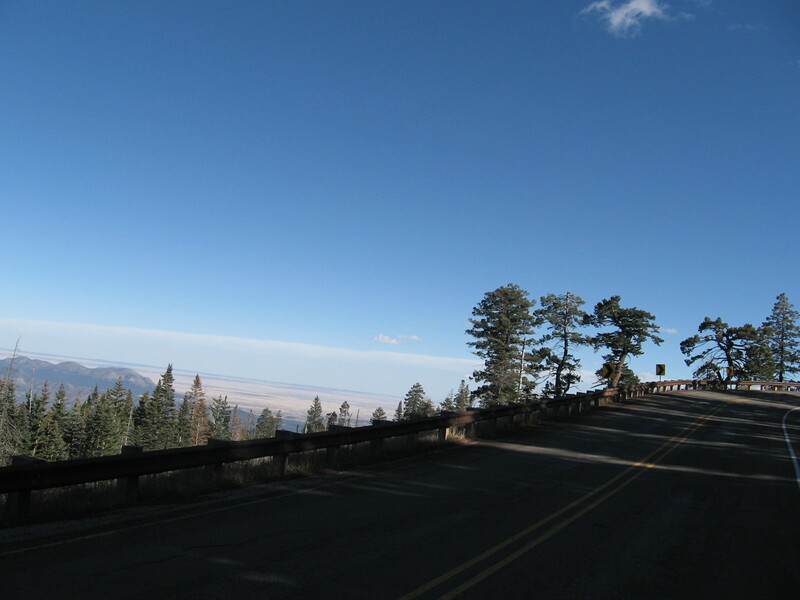 This Crest road begins on the opposite side of the mountain from Albuquerque. 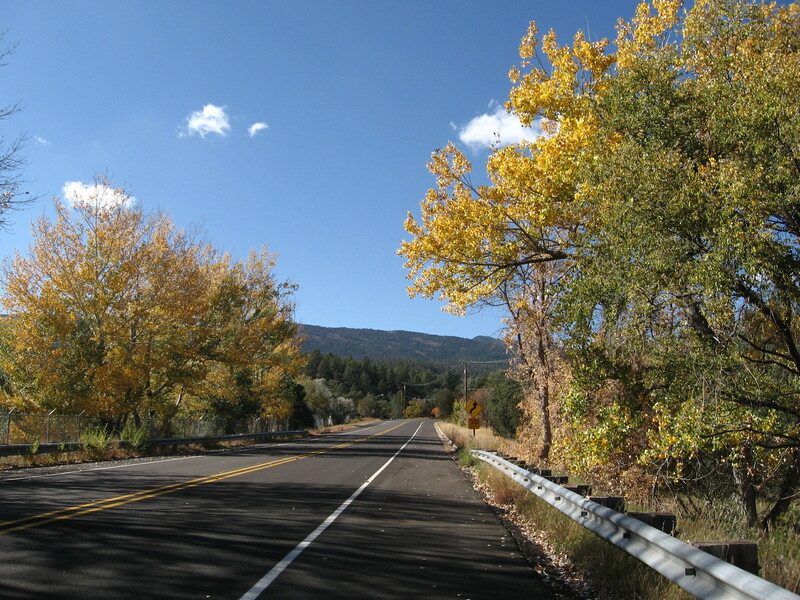 So to get here ride through Tijeras Canyon and either turn north on HWY 14, aka the Turquoise Trail, or there are some quieter routes weaving through the laid back tapestry of the east mountain communities. 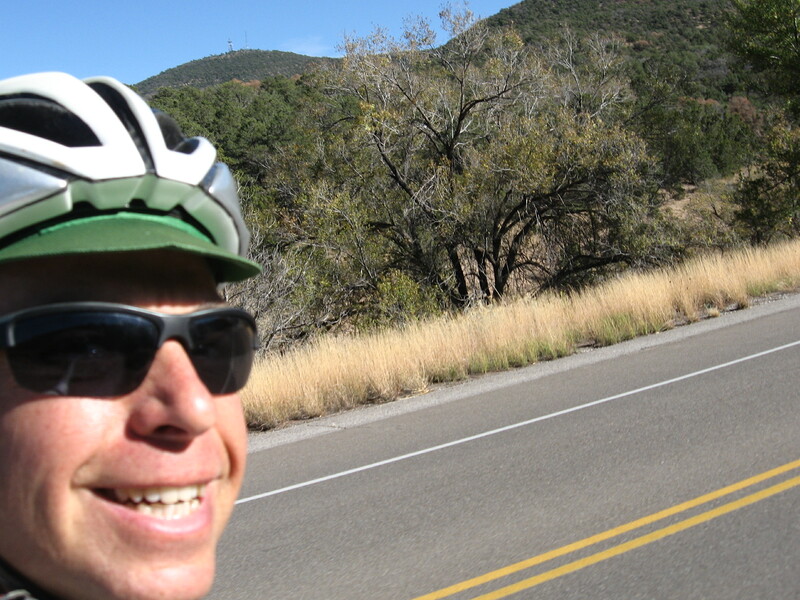 I love feeling the resistance through the pedals as I climb a mountain road on a bicycle. 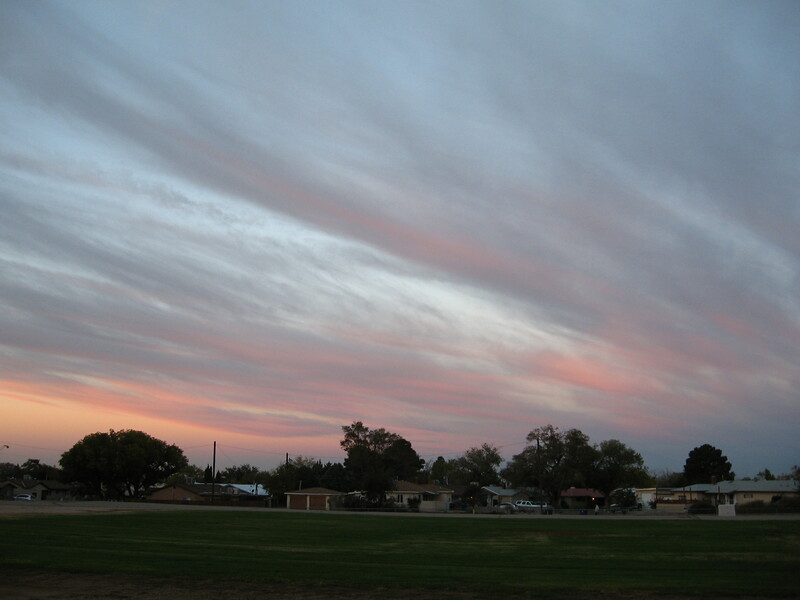 The world slows down but your body rhythms accelerate, your breathing, cooling systems, energy consumption. The slow motion intensity brings a steady concentration. 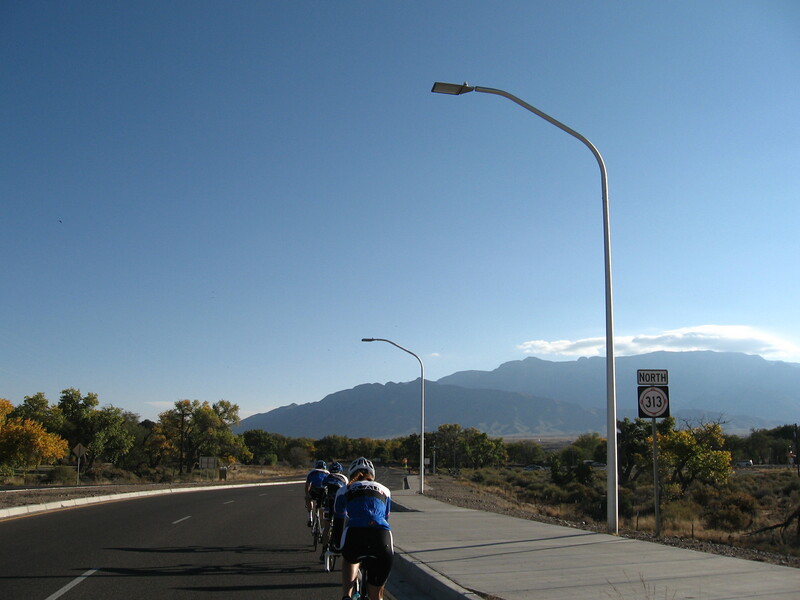 There’s a flat stretch after mile six where you can get some relief as you ride past the Sandia Ski Area. 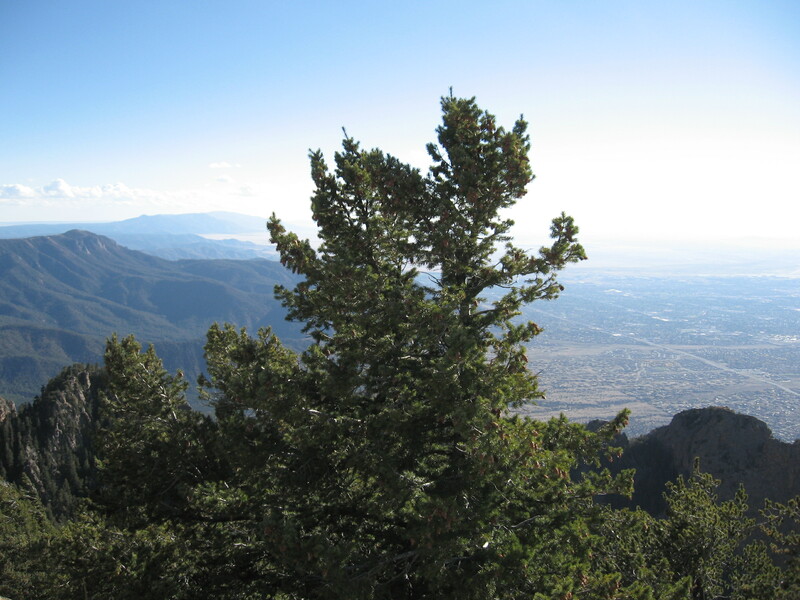 That’s at 8,600′. So you can kind of think of it as a two part climb. Anything to help approach this gigantic beast! 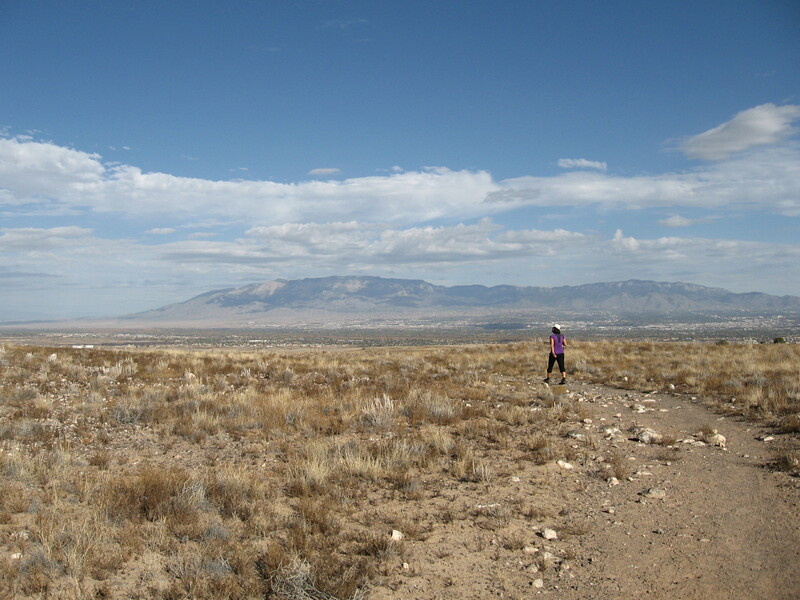 There are trailheads for walks with great vistas. 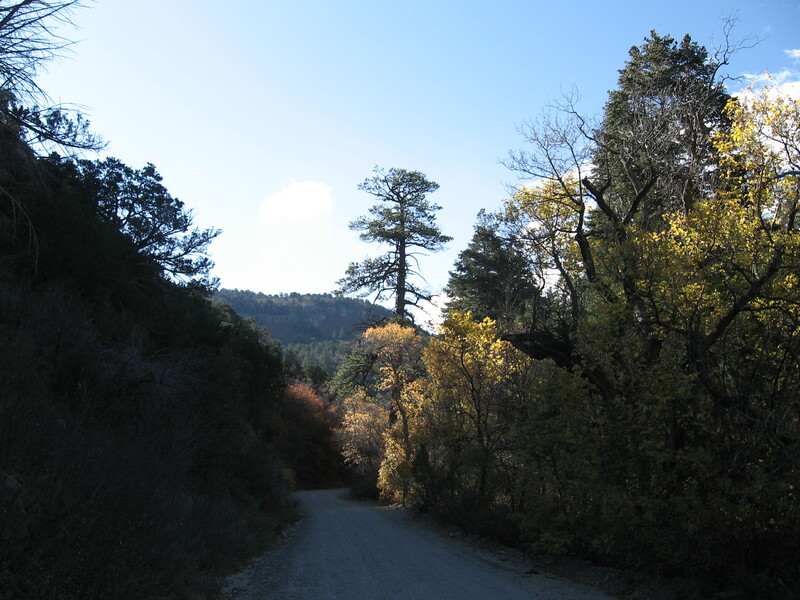 Many bear, turkey, deer and animals all around in this forested highlands. 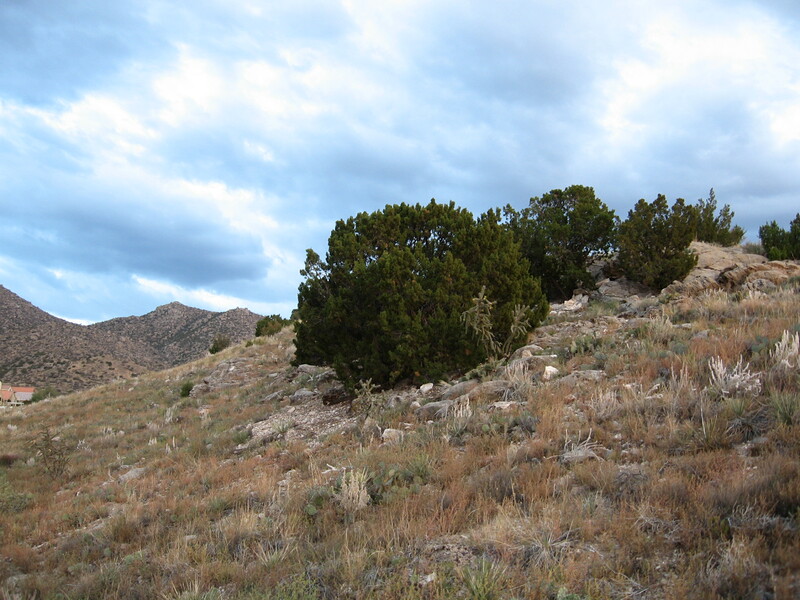 There used to be bighorn sheep, the Rocky Mountain kind. 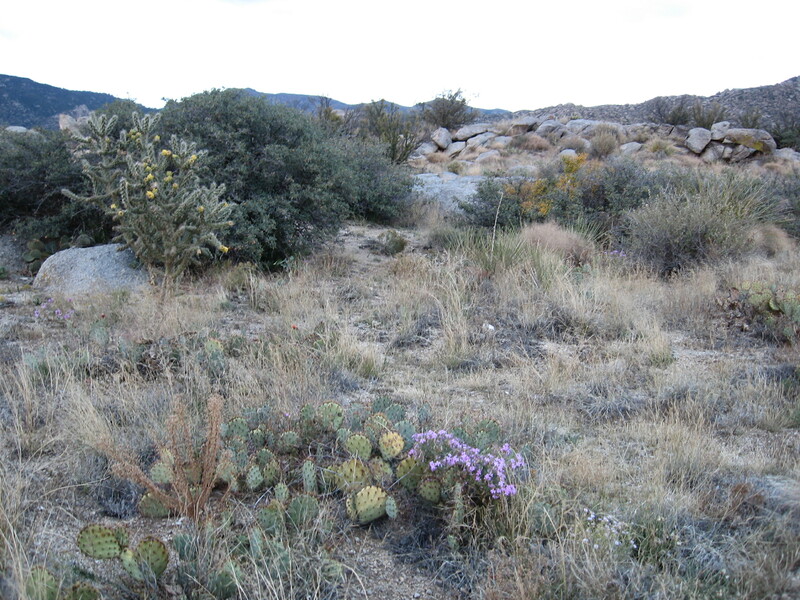 Now I think the closest sheep live in the Manzanos to the south. It’s a new world up here. 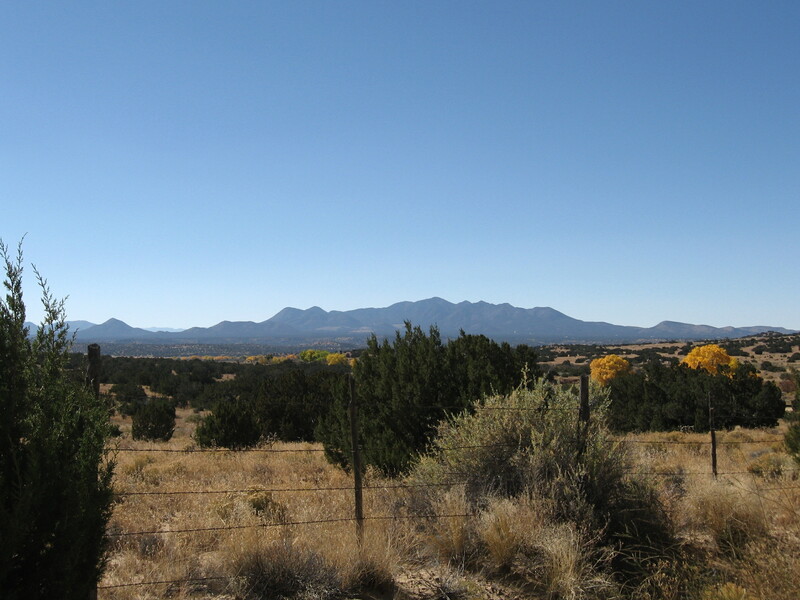 You break out through the edges of the forest with great vistas to the desert and distance mesas and ranges. 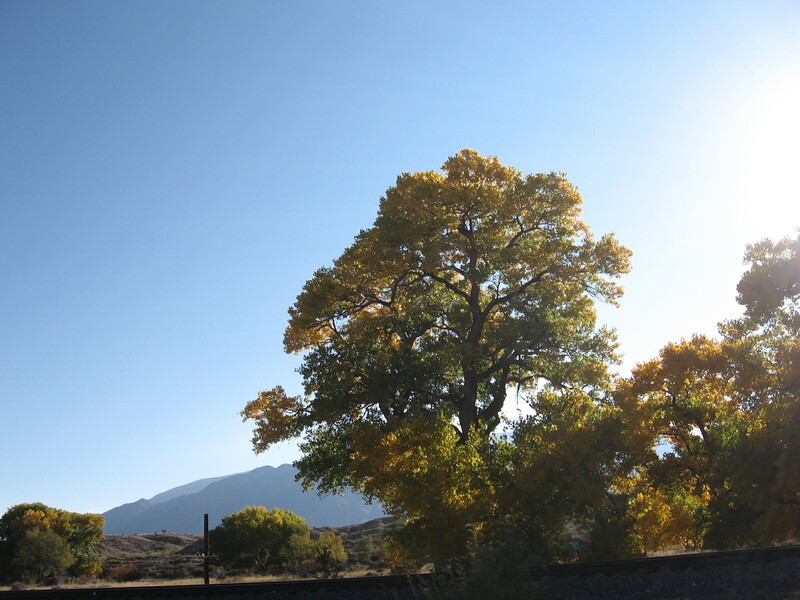 The color of earth and sky and scent of the trees is amazing. Invigorating. Cleansing. 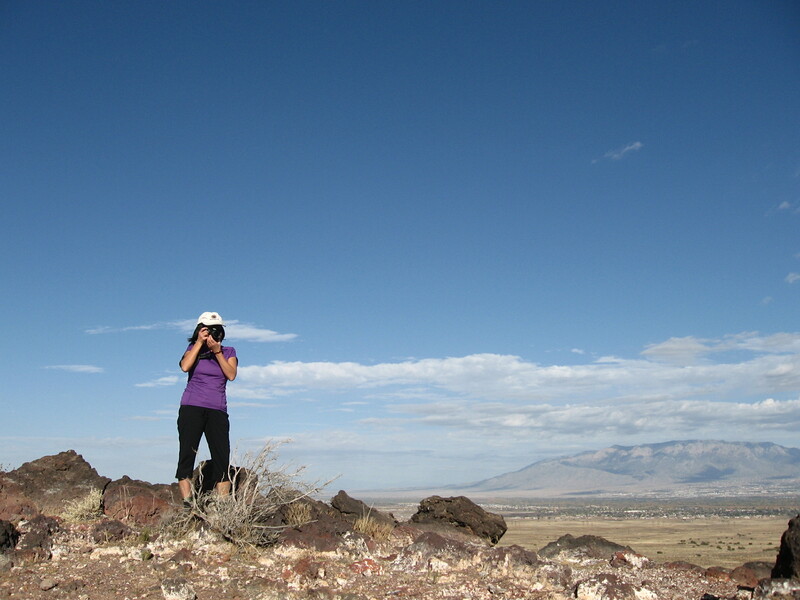 I feel incredibly alive when I’m climbing! 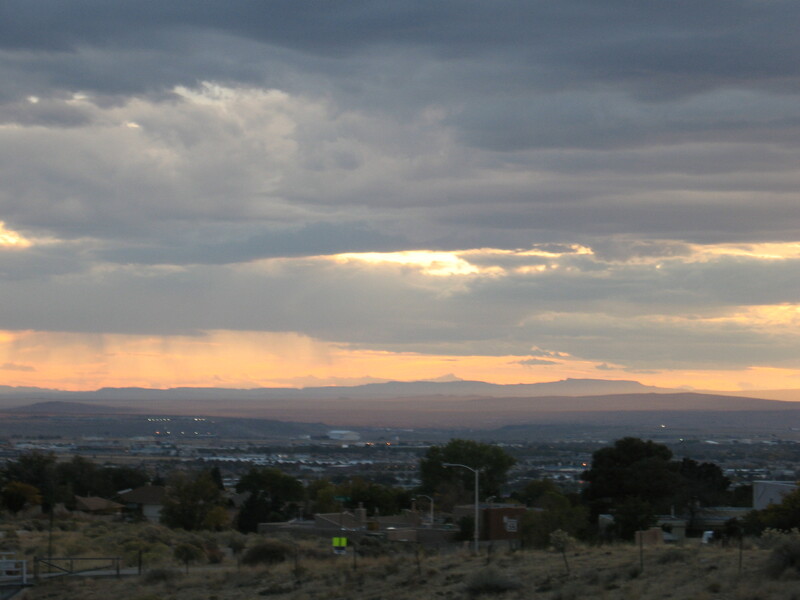 Albuquerque sits right next to the mountains. The transition areas and connectivity between are special. When you get to the top you have done something today! I keep meeting great people there and having fruitful exchanges. Yesterday a gentlemen told me about the Seattle to Portland two day ride. I’ve got to do it. I told him about Albuquerque’s own Day of the Tread ride. He’s going to do it. 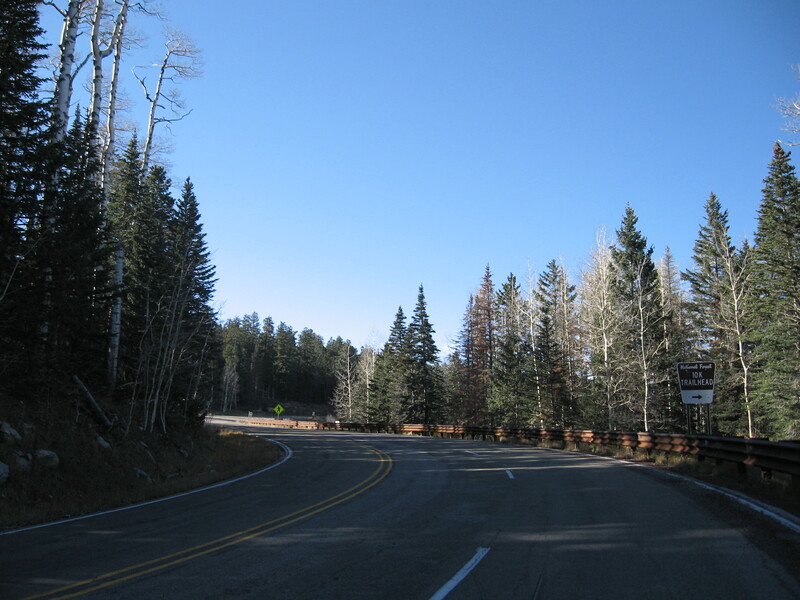 The Crest road reminds me of Going to the Sun road in Glacier National Park. Everyone is happy to be there because it is so obviously awesome. We are all overcome in a way by this shared experience of being in such a marvelous place at this moment in time. 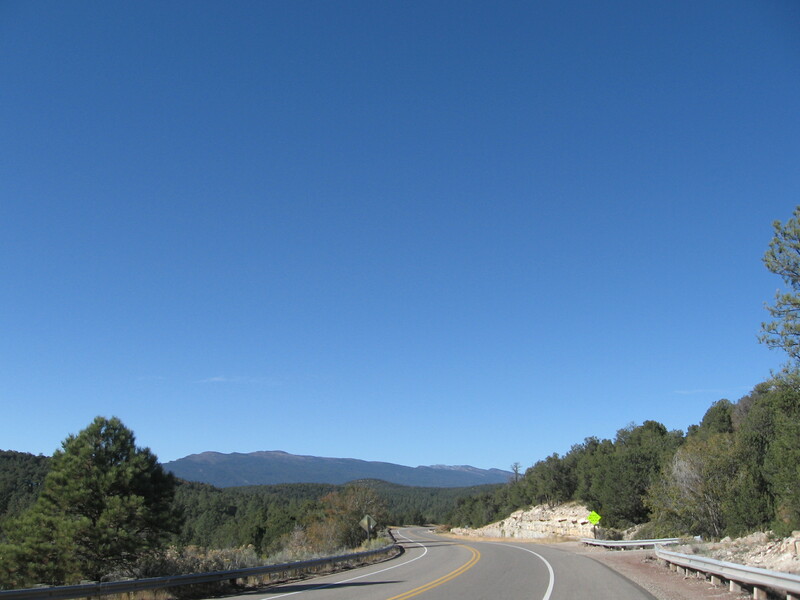 This road is special to me because it is right next to home and is a classic Southwestern US sky island type ecosystem with bands of colorful rock showing and that famous New Mexico blue sky glowing a deep penetrating blue. The workout is fantastic. Riding above 10,000′ is not easy. 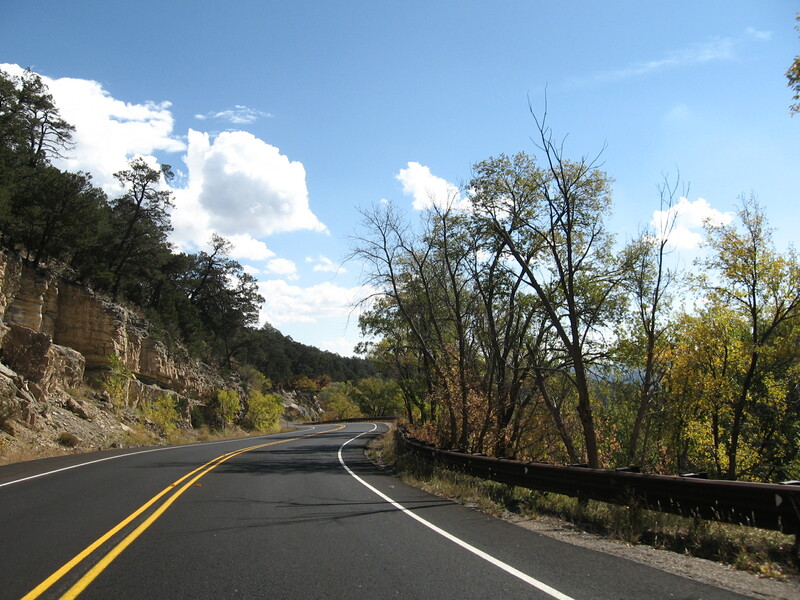 This entry was posted in Uncategorized on October 28, 2014 by bikeyogiblog. Biking, walking, music. These things make me recognize the heart of the day. Meditate on matters. 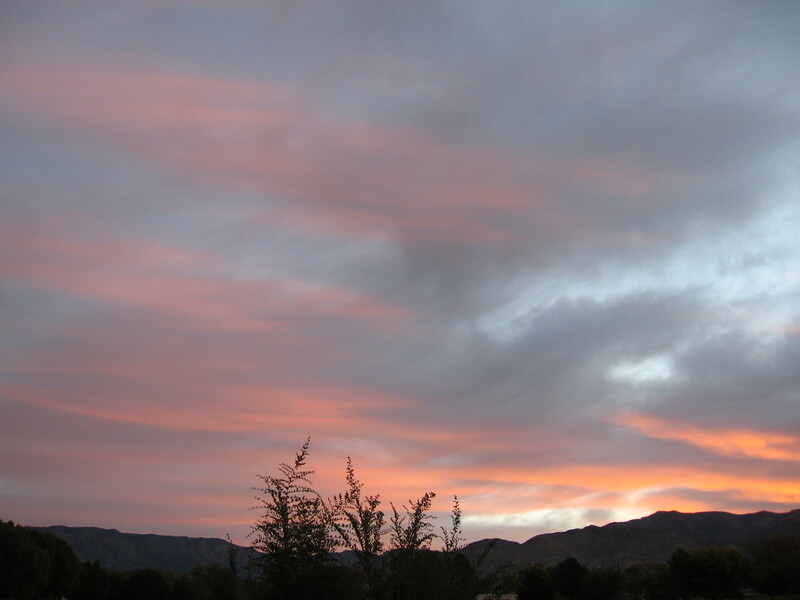 Bring my thoughts to repose and stir new awakenings. There are many beautiful turns in life. 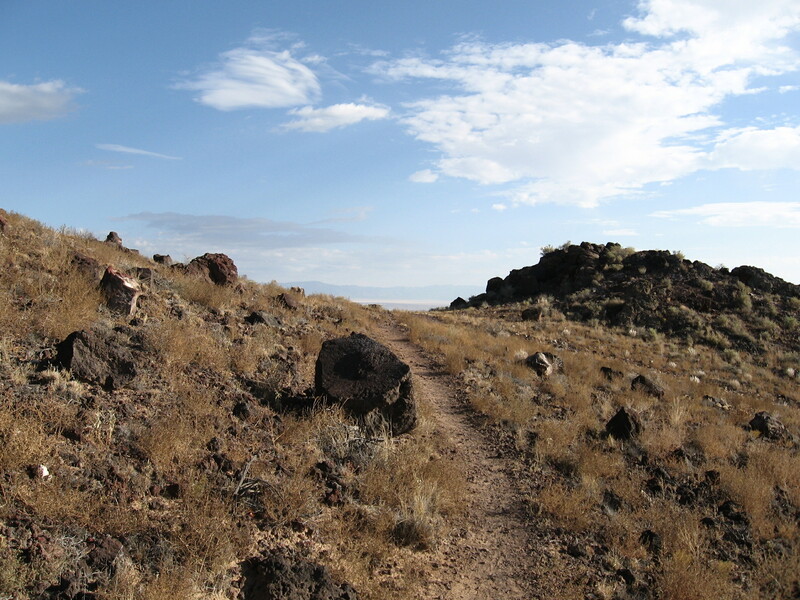 Sometimes a tour down a trail can be a corollary for the larger journeys we are making. 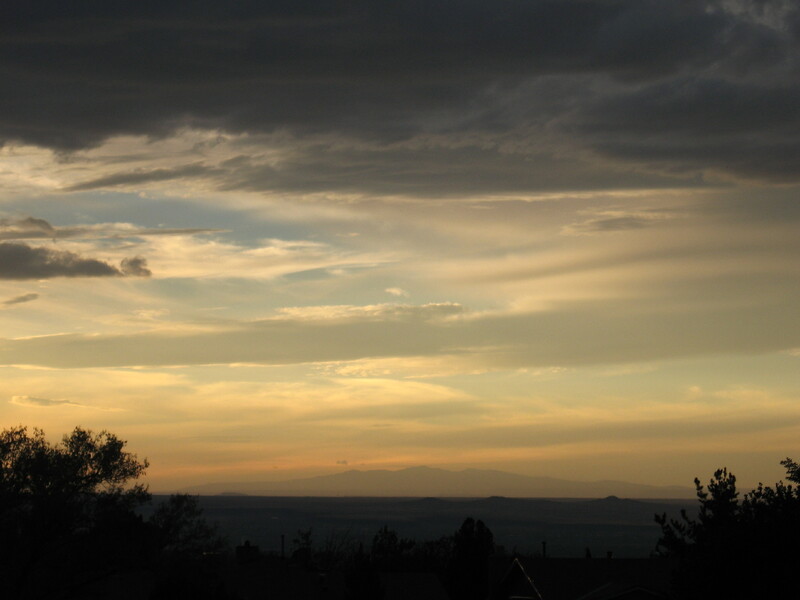 Sunday evening we walked up into the foothills from Embudito Hills Park. The texture of the land here is remarkable. 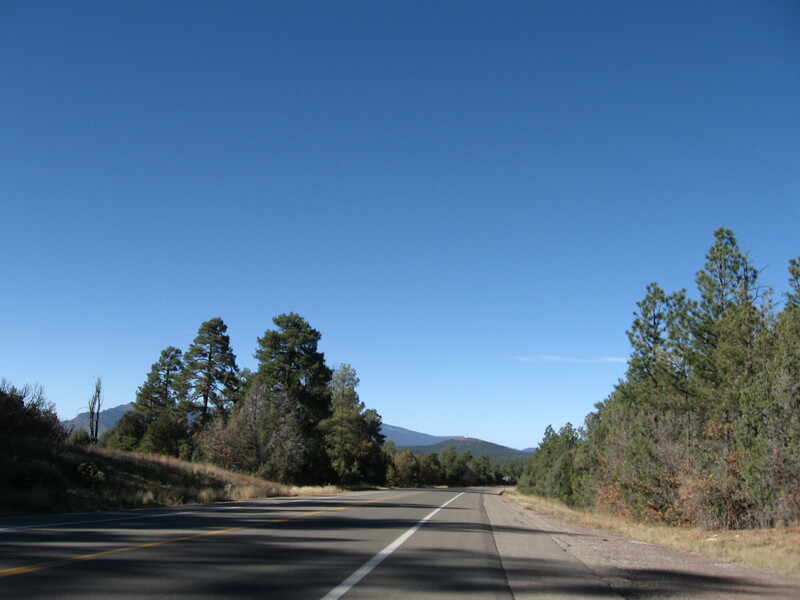 The San Francisco Peaks of Flagstaff are well beyond the visual horizon, but the San Mateo Mountains are beautiful and prominent here with an echo of space between us. 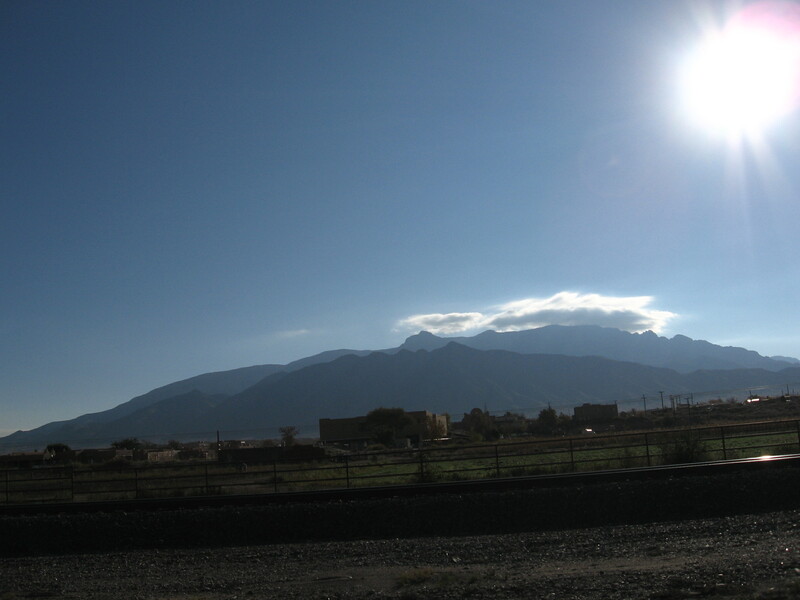 These mountains make me quiet with awe and solace, like ancestors bearing ancient unwritten wisdom. We process what we know so we can move on. We reconcile what we know with the mystery and do our best to make sense. Most importantly we draw the inspiration to go onward carrying purpose. The meaning we ourselves create, and it may be worth something. Try it. 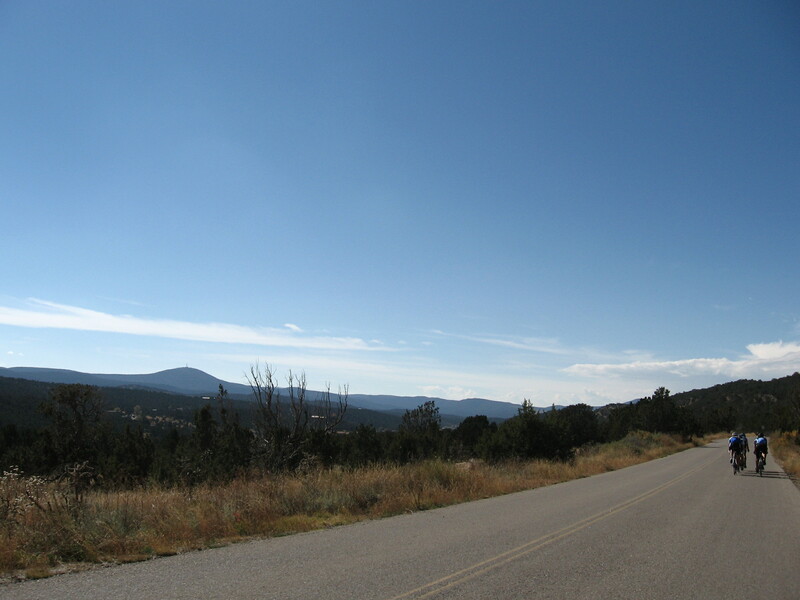 The mesa the Acoma people call home is on the horizon and to the right tilting. The light is good here. 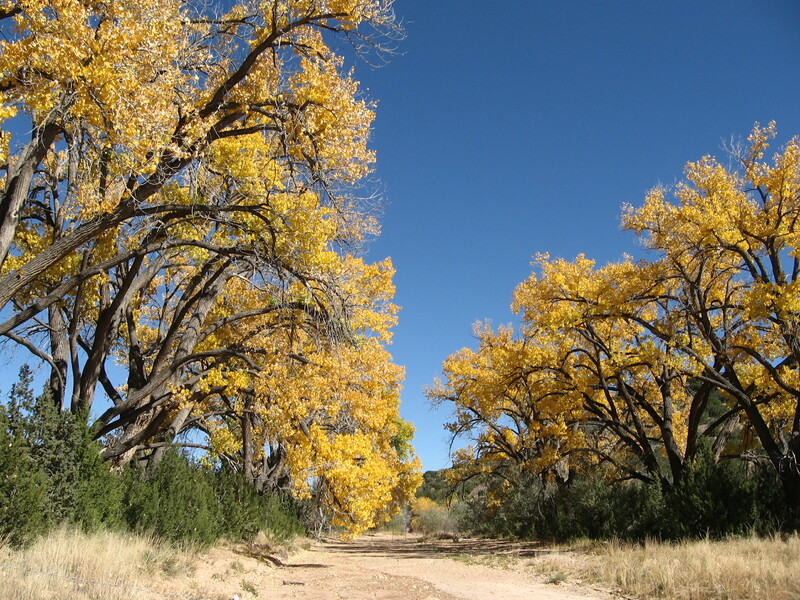 Trees have an enduring presence and parent along many communities of smaller plants. Purple is the color of dignity and many people look wonderful wearing it. We live a few miles from the foothills so we drove to get here. I’m not an idealogue at all when it comes to transportation modes. I use it all and think this is one of the great boons of our times. The main thing I try to concentrate on is to not overdue any one thing and only spend my resources on what is truly important. 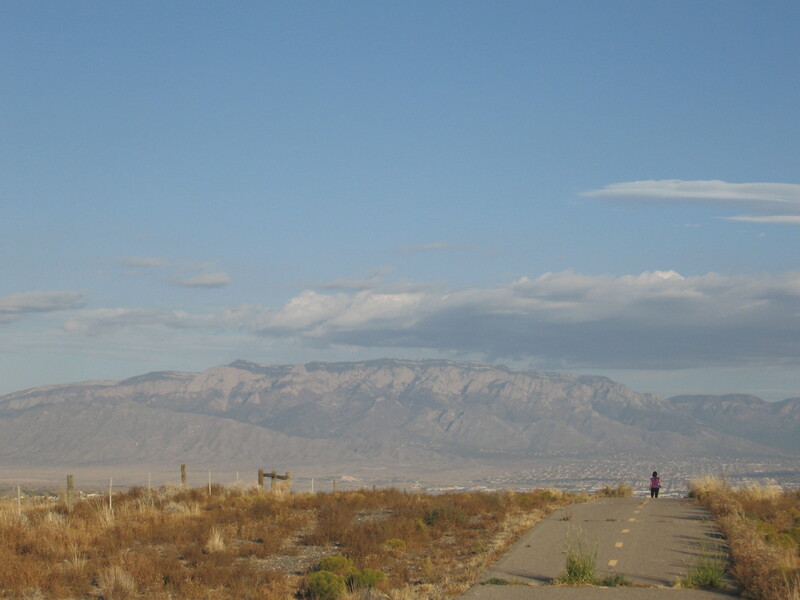 A walk on Sunday evening in the Sandia Foothills with Mai was the right thing to do. I enjoy every moment. 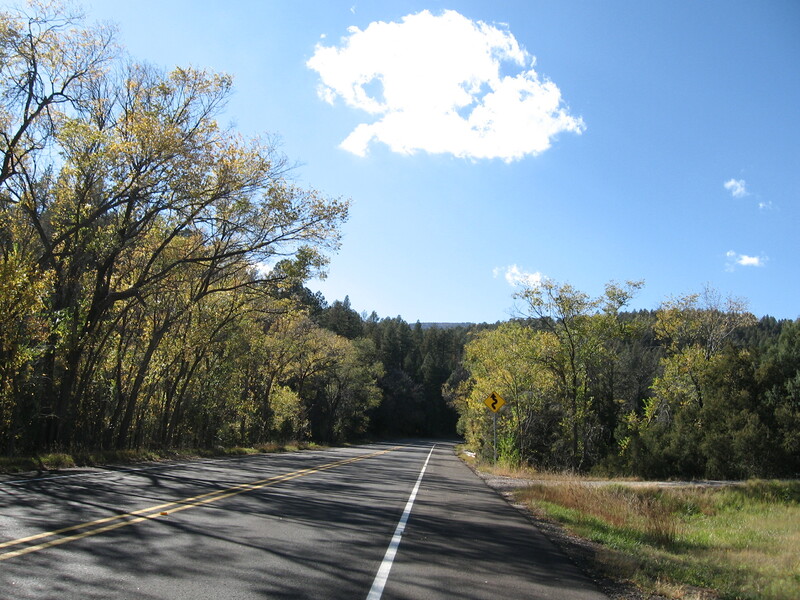 This entry was posted in Uncategorized on October 27, 2014 by bikeyogiblog. 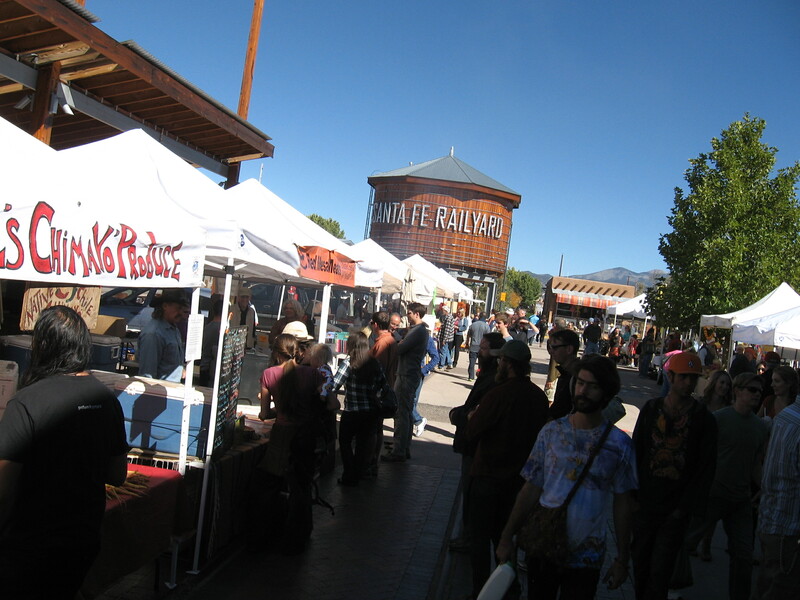 Mai and I ventured up the Santa Fe Farmer’s Market this Saturday morning on Interstate 25. 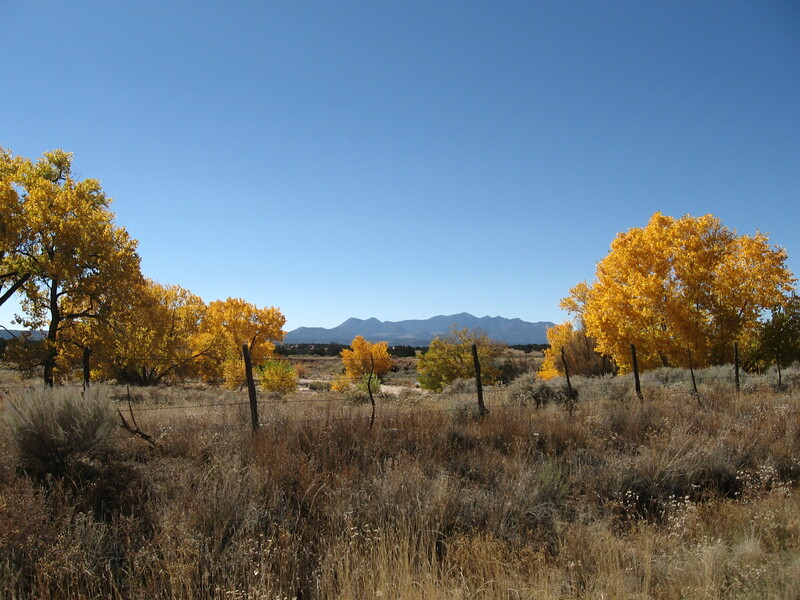 We came home the long way through the rolling terrain along the Galisteo River watershed. 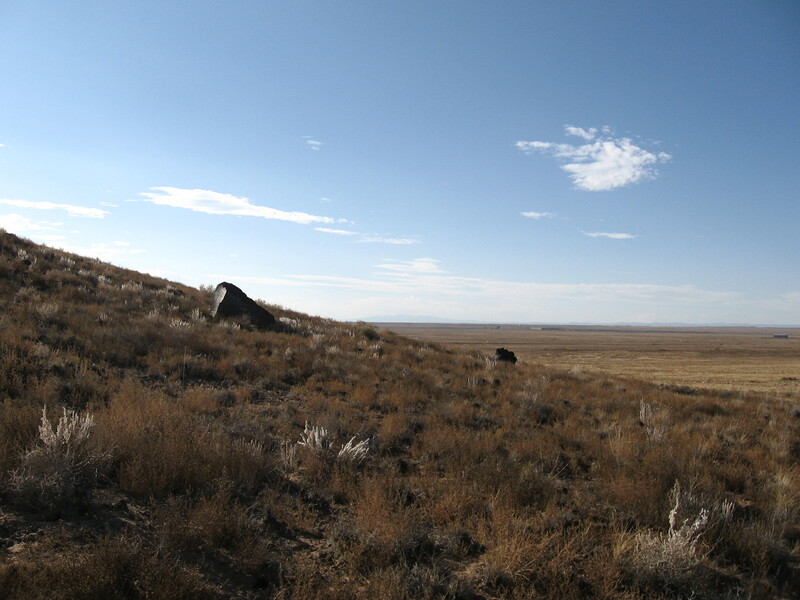 It is one of the most spacious, imaginatively configured landscapes I’ve encountered. Reality transfigured. 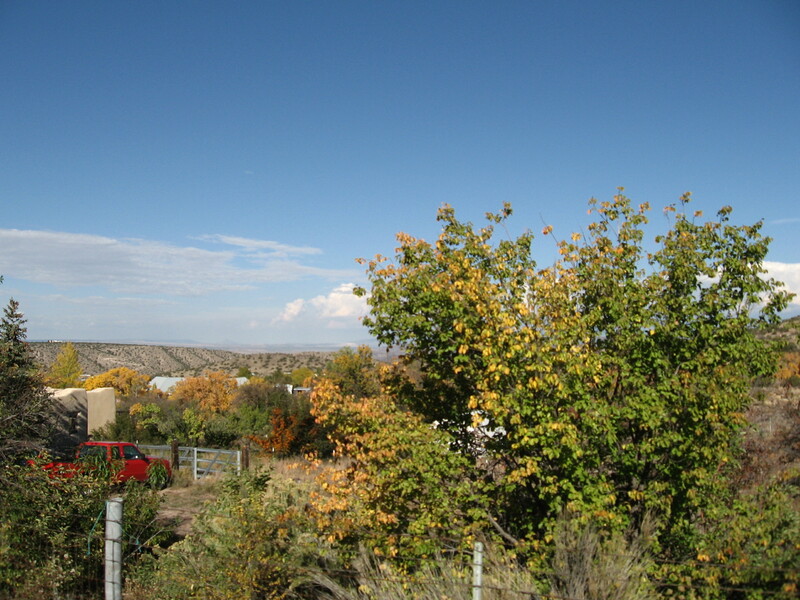 A few people live out here but you’d want to keep a local life grounded in place. I definitely will do some riding here. 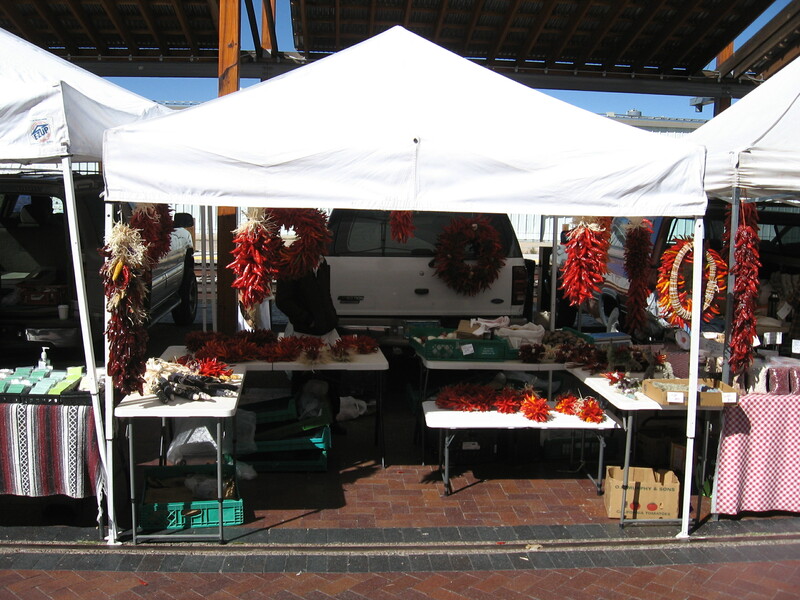 The food traditions in New Mexico run deep and there are so many cross cultural currents. The vivid displays of food at the market reminded me of my first trip to Japan when Mai took me to the Kanazawa morning seafood market. 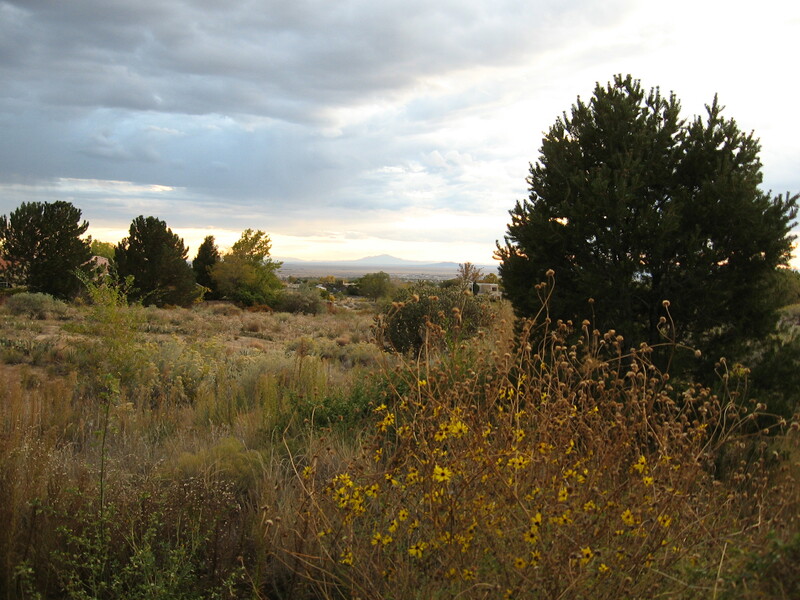 New Mexicans place supreme value on fresh food and try to eat directly from the local land. It tastes amazingly good, and ties your spirit in with place. 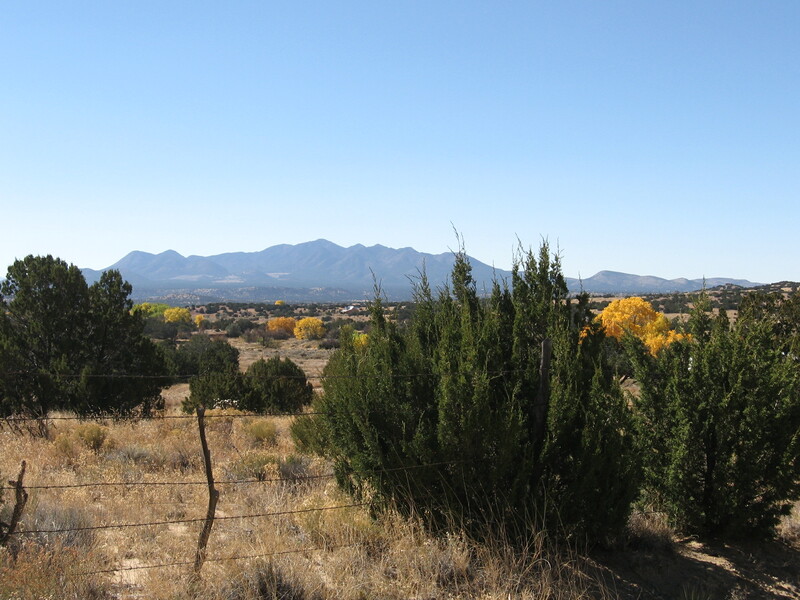 What is land good for? For one it provides the elemental fuel for all human activities. It also provides a measure of our inheritance which seems not an entitlement we have the liberty to waste wantonly. 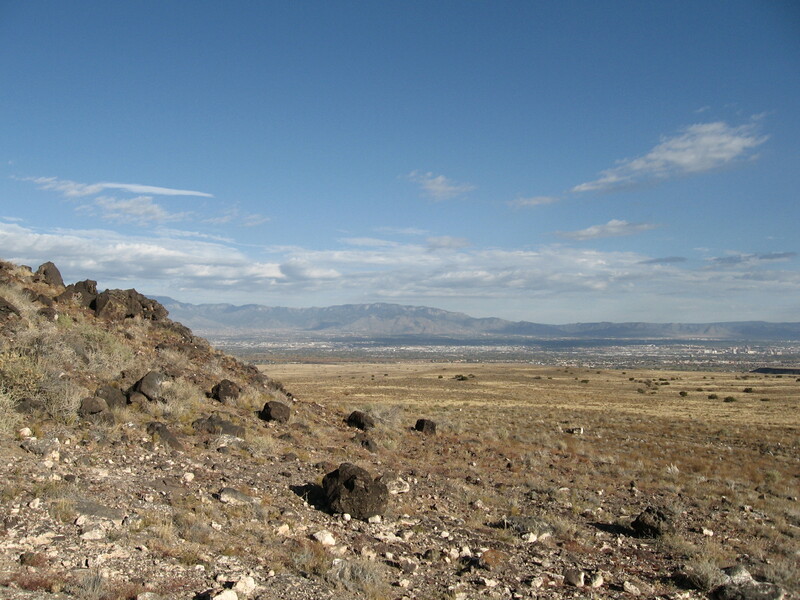 Different locales hold unique ecological stories. Wild places can be visited and admired but if you try to own it or sell it that sometimes intangible integrity erodes or vanishes all together. 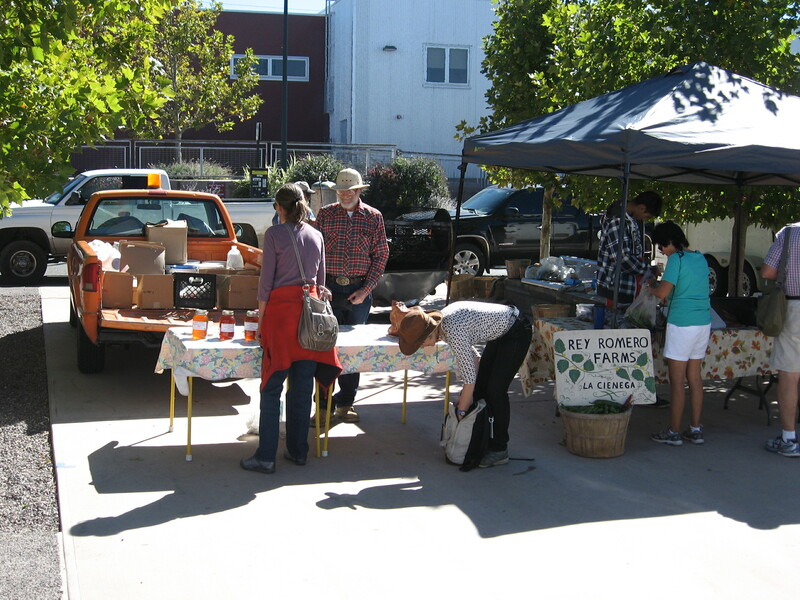 You can nurture life on the land and taste the land’s story through food! I’m grateful there are many places that have good integrity to enhance strength in our bodies and exude tranquility to fortify our spirit and find our compass directions in life. 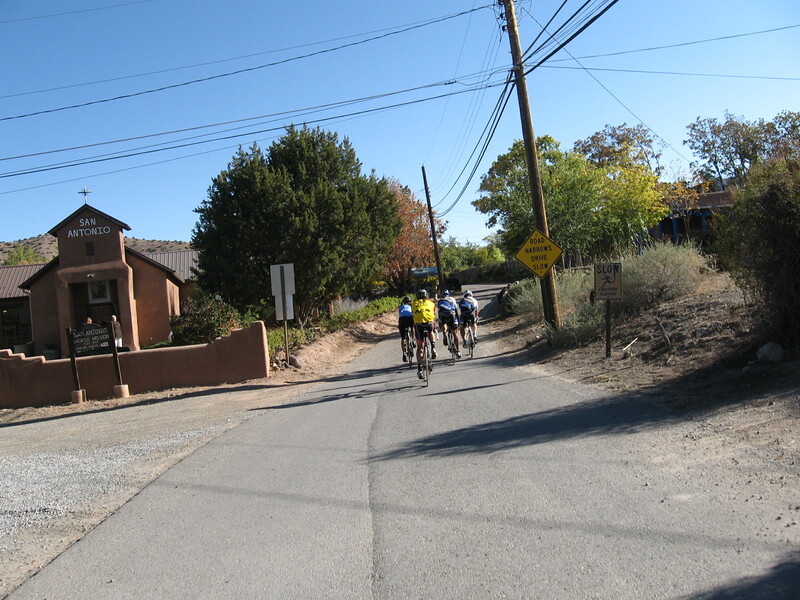 Sunday morning I met the Scalo Veloce bicycle team at Michael Thomas Coffee Roasters for a classic ride called around the mountain. Here’s a map. Here’s the soundtrack. 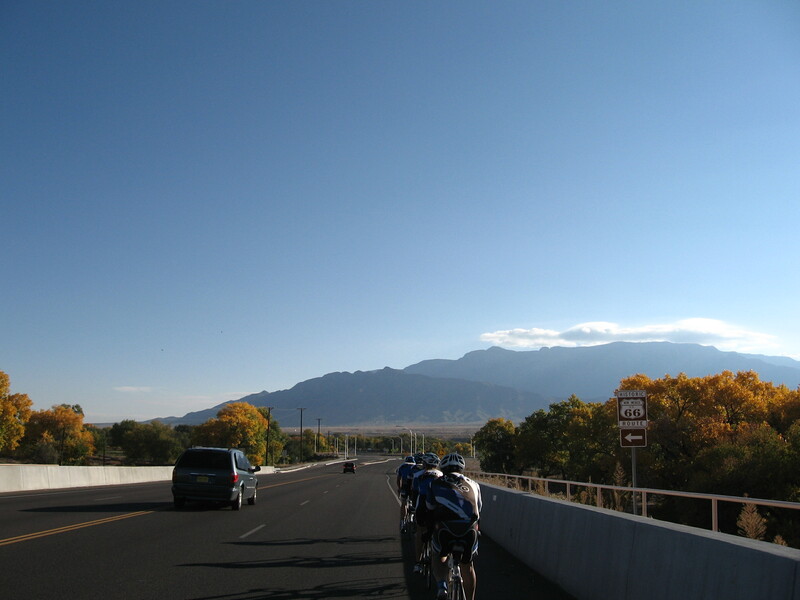 The ride circumnavigates the Sandia Mountains. I first heard about this ride from Michael Hernandez while I lived in Reno, NV. This ride is helping me put new roots down. The pace was relaxing as most folks oriented towards racing this time of year are doing the cyclocross series. 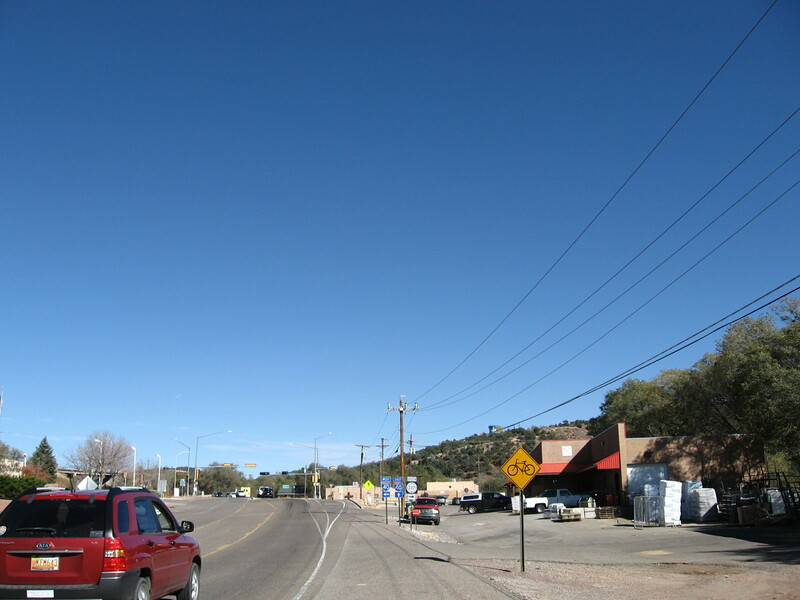 The railroad tracks that carry the Railrunner, the commuter train between Santa Fe, Albuquerque, and the valley communities south, are adjacent to this roadway. 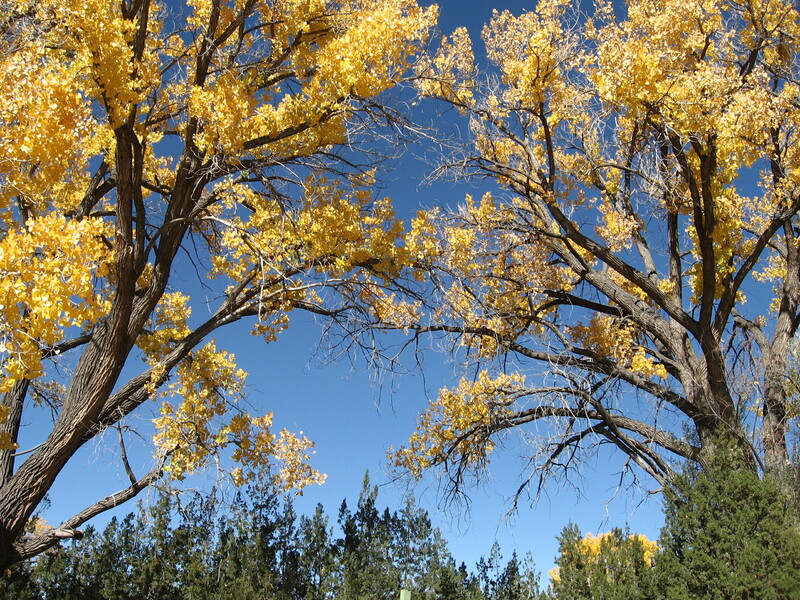 The Fall has been splendidly mild here. What a great day today. 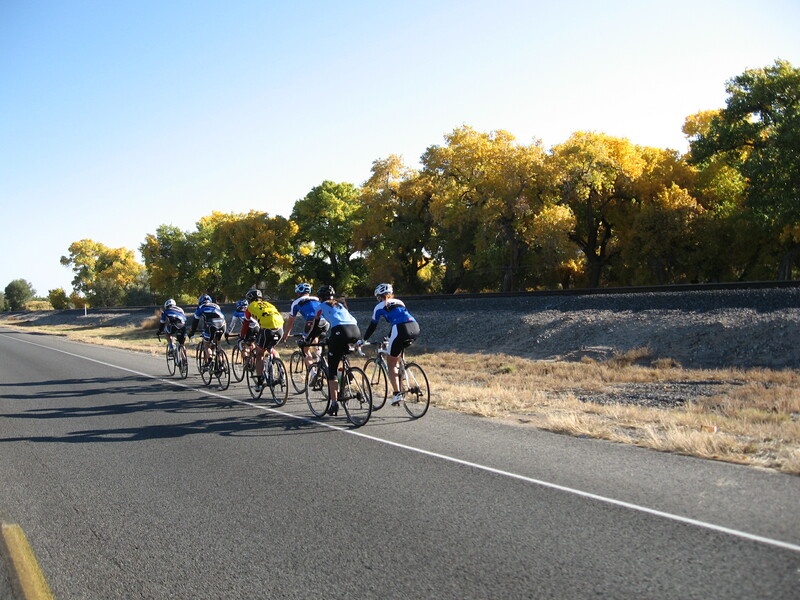 The Day of the Tread festivities–charitable bike rides, walks and runs–were happening today and we passed some of the riders along the route. It is inspiring to see the community come together around activities that share in the spirit of celebrating life by creating new adventures, and helping others along the way. 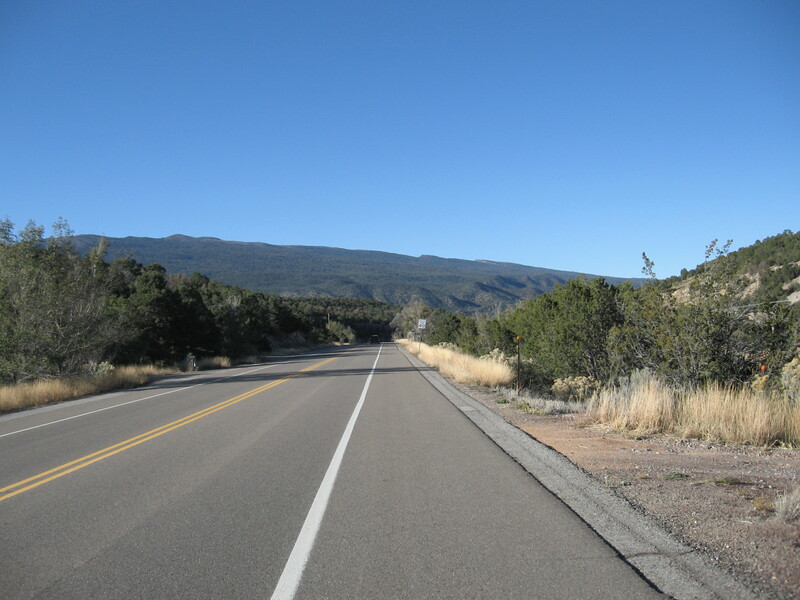 The difference in the Scalo ride was once through Placitas and the paved road came to an end, we kept going on the dirt to traverse the mountain. 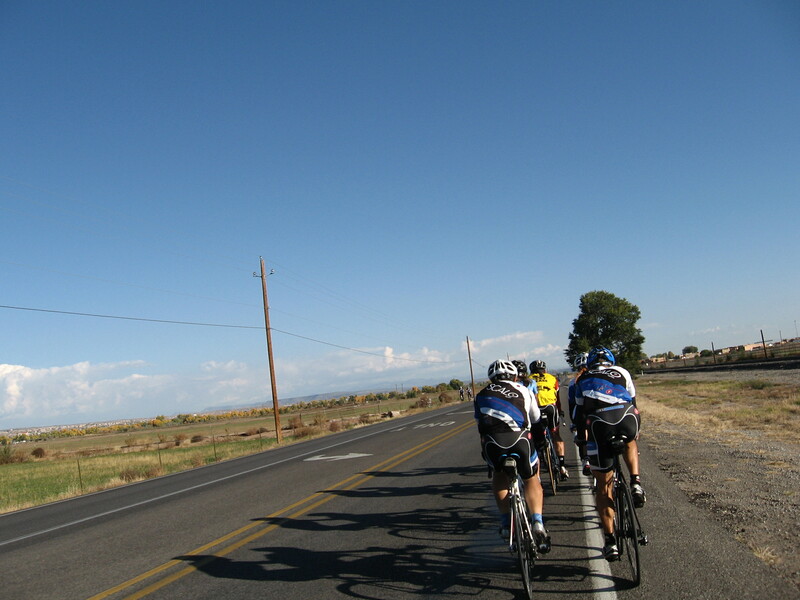 All the charity riders turned around, being perhaps more reasonable adventurers. They were following their course, we were following ours. It was fun to overlap a bit. 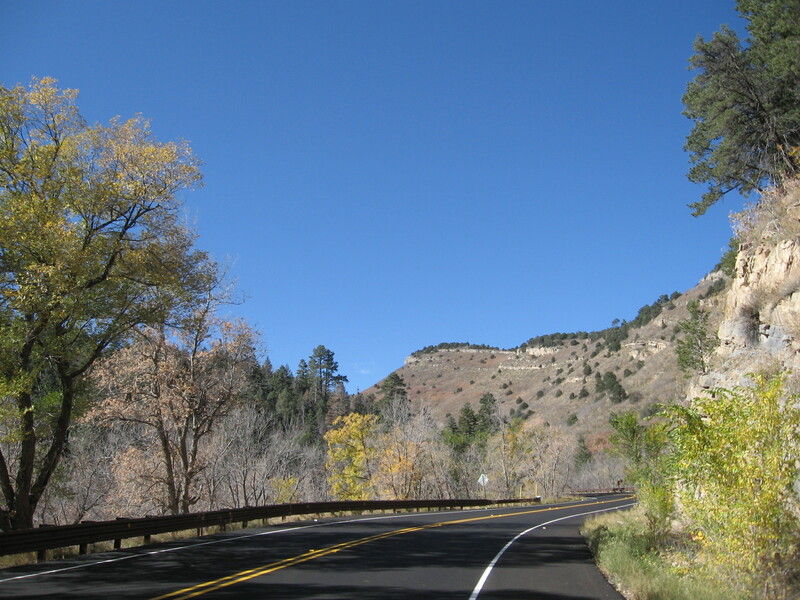 Las Huertas canyon is the secret way up the Sandia Mountains. There is a cave with ancient history. A stream. 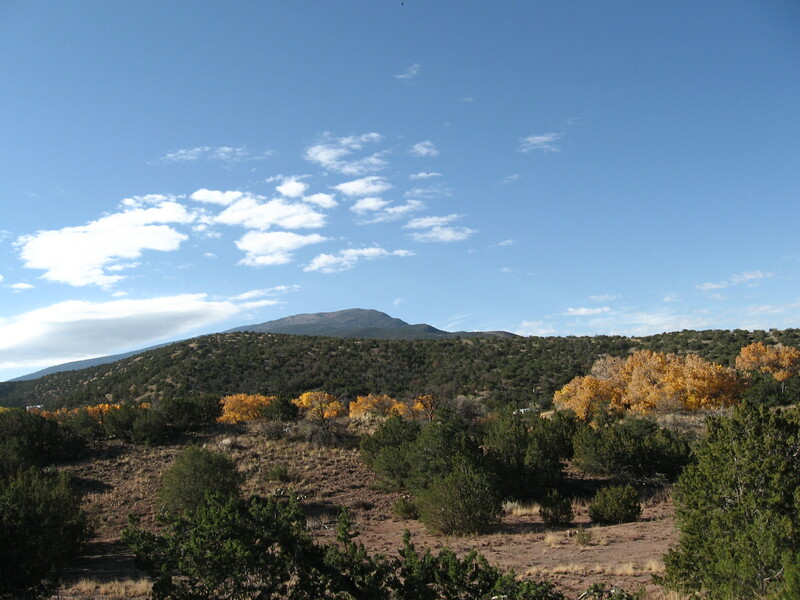 Piñon and Juniper trees changing to Ponderosa then Spruce and Fir then back again in areas with high sun exposure. 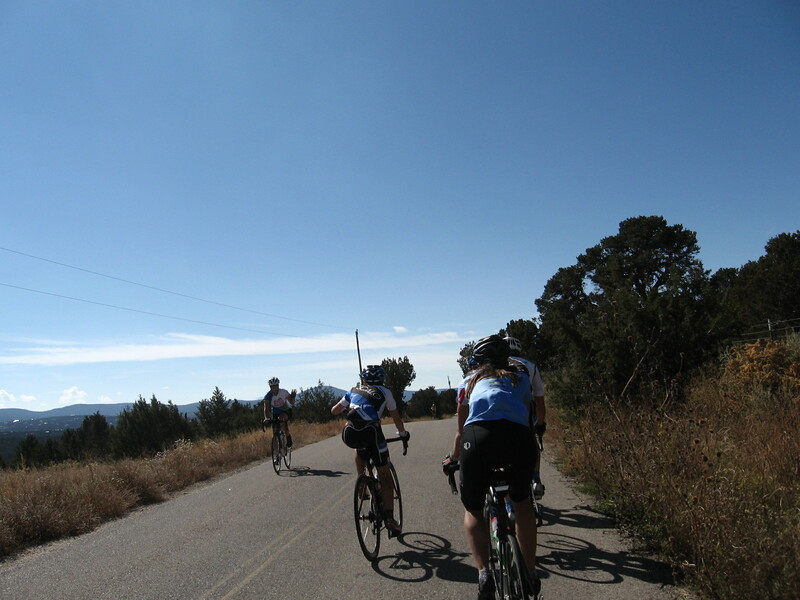 We regrouped at the top of dirt climb. 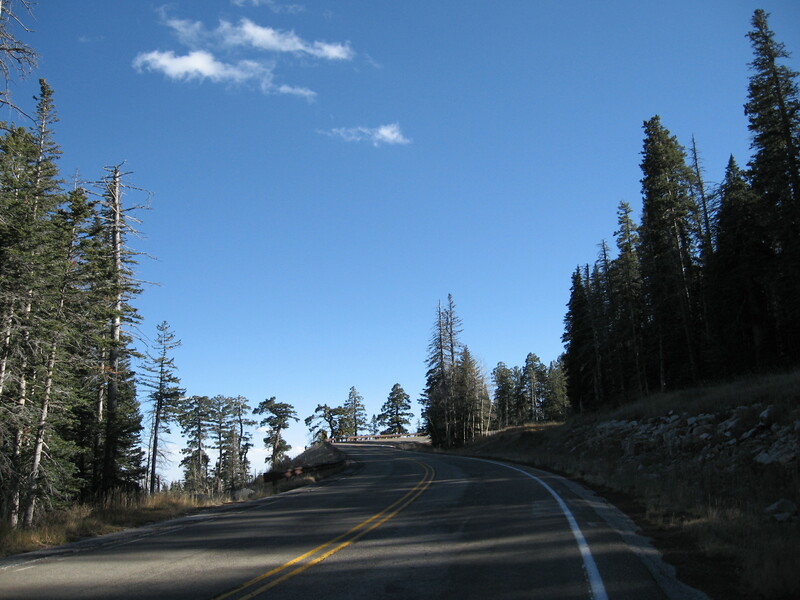 It is funny how the suffering you endure on the climbing melts away on the summit. 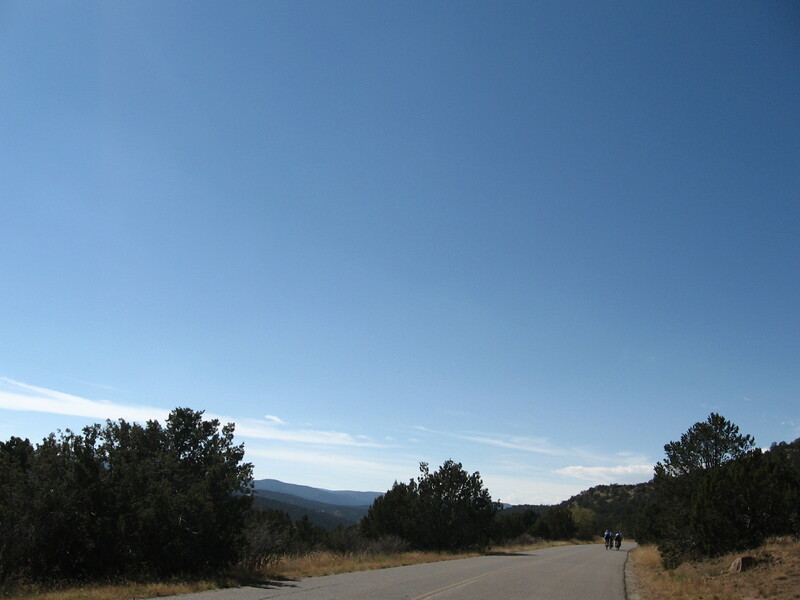 The giddy feelings of accomplishment and a roaring descent turn the corners of the mouth up. 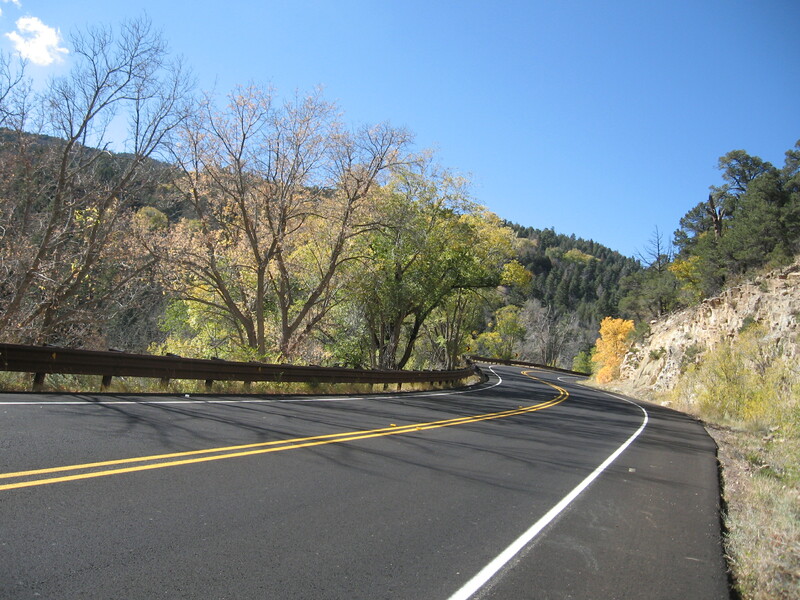 Going down the Crest road on new pavement towards Sandia Park is a blast. 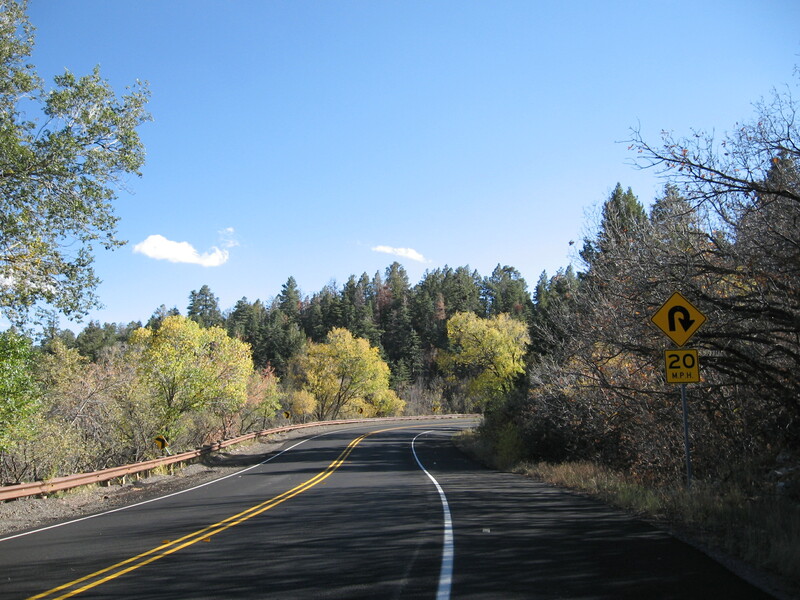 The Crest byway is a good road. My favorite ride is up this and then down this. 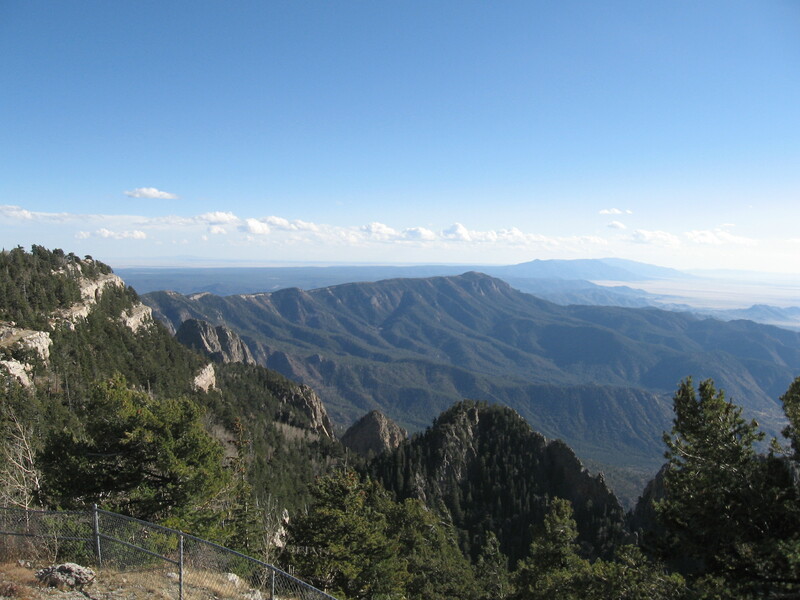 Honestly if they allowed me to take the aerial tramway home at the top I wouldn’t necessarily bother all the time with the descent, especially in winter. I like climbing! 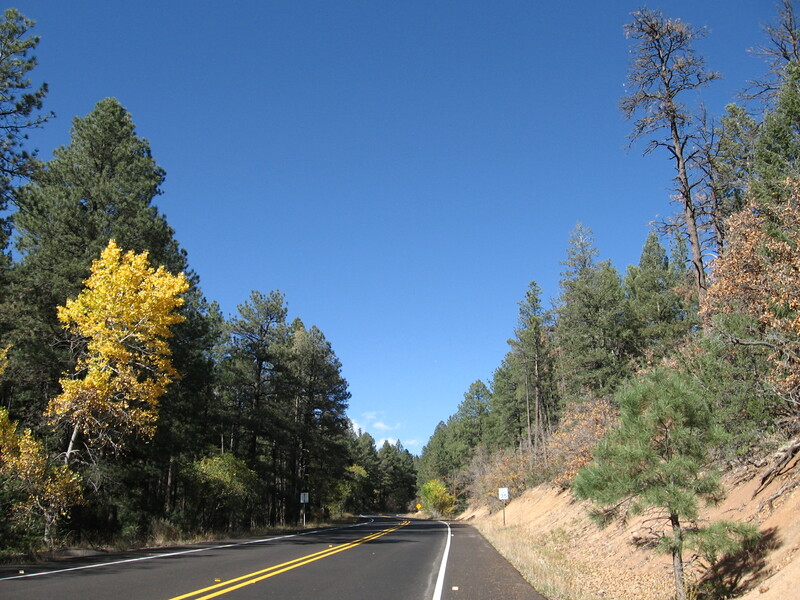 After descending the Crest we meandered through the east mountains heading back south again before making a coffee stop at the Pedaler’s Café. 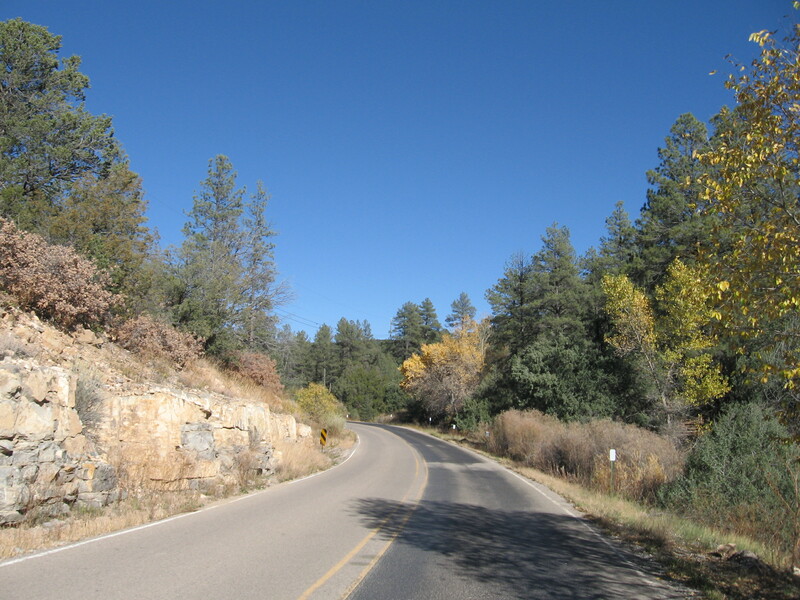 Home through Tijeras Canyon completed the loop around the mountain. 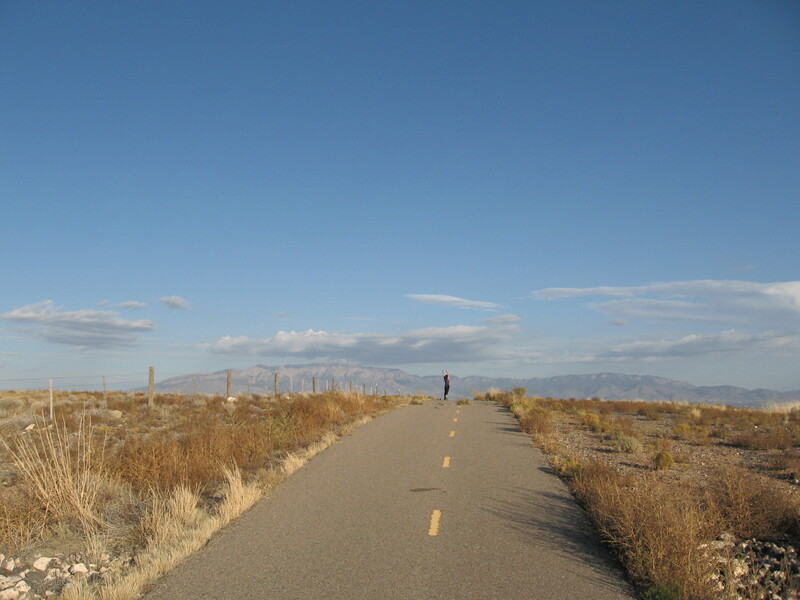 This entry was posted in Albuquerque, biking New Mexico, exploring by bike, Uncategorized on October 27, 2014 by bikeyogiblog.